One of my favorite parts of vacation is simply waking up when you naturally do and then taking the morning at a relaxed pace. So that is exactly what we did this morning. We grabbed a light breakfast in the hotel and then took our time getting ready to venture out. We decided to experience the city like city dwellers do and bought a couple metro passes. 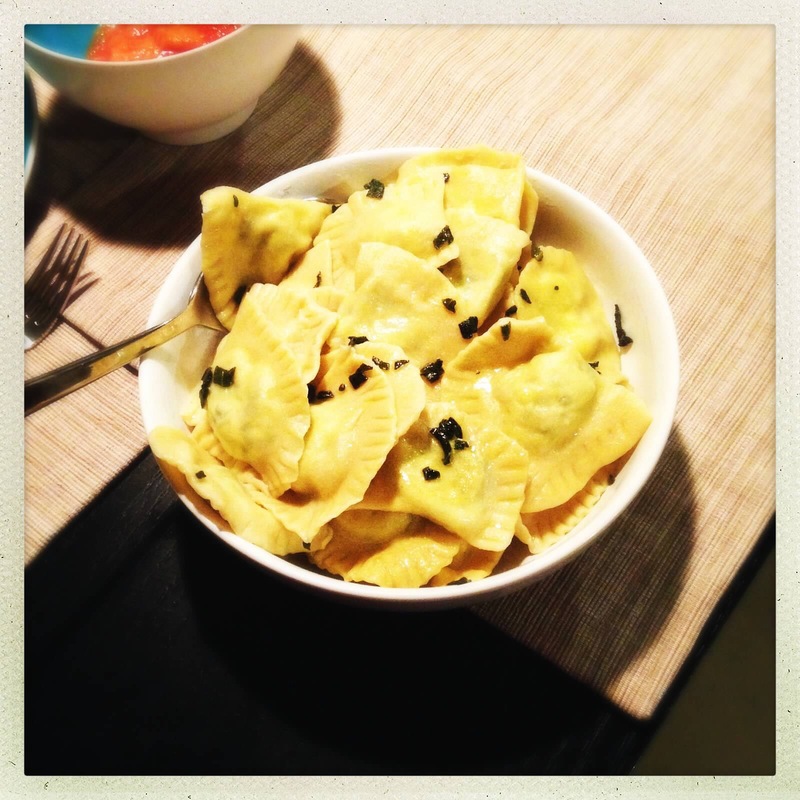 We took the subway to the Le Plateau – Mont Royal neighborhood. 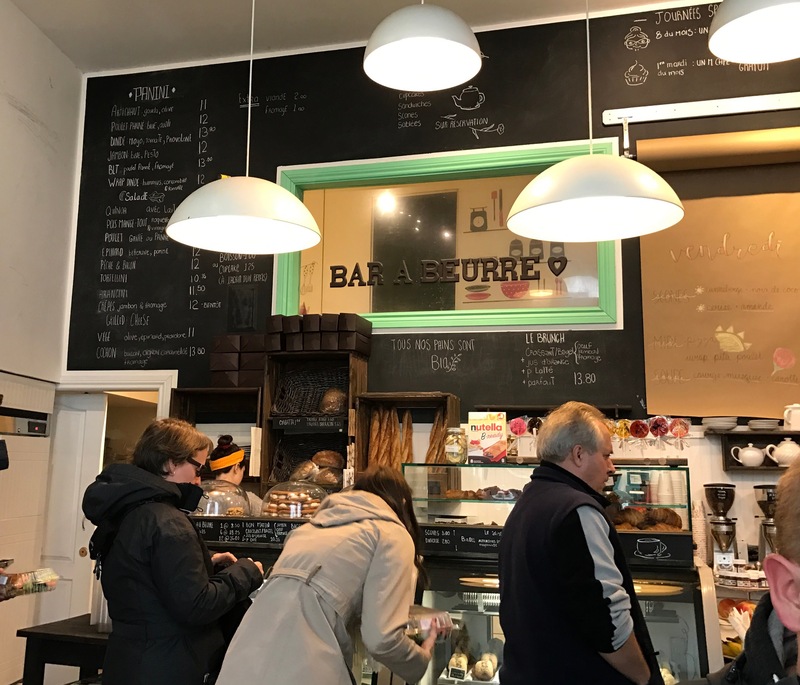 Whereas Old Montreal feels European and the Little Burgundy neighborhood felt a bit like Logan Square in Chicago, Le Plateau felt a lot like Bucktown in Chicago but with a lot of French woven into the shop signs and the overheard conversations on the street. 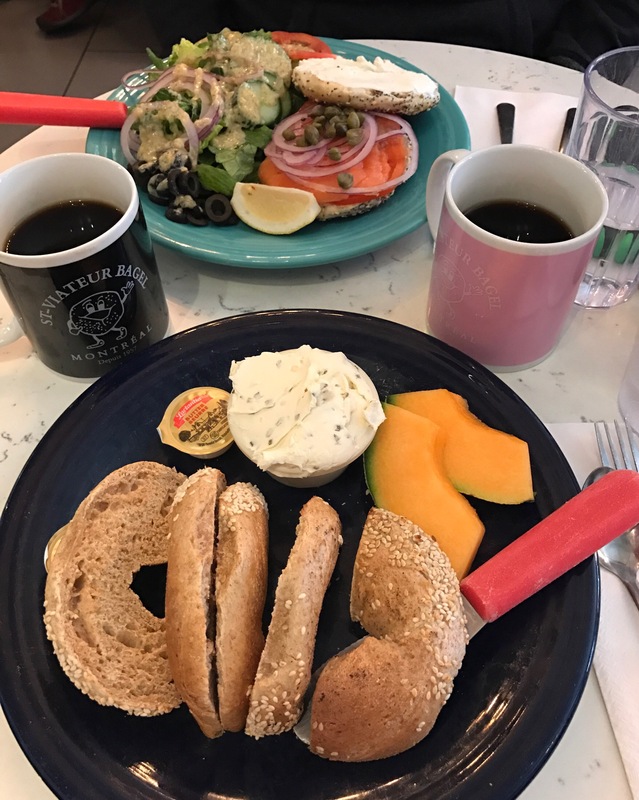 Our first stop in the neighborhood was for a more substantial breakfast at St. Viateur Bagel & Cafe. I had heard a lot about Montreal bagels prior to coming here and this shop specifically was recommended to me by a coworker. It did not disappoint! 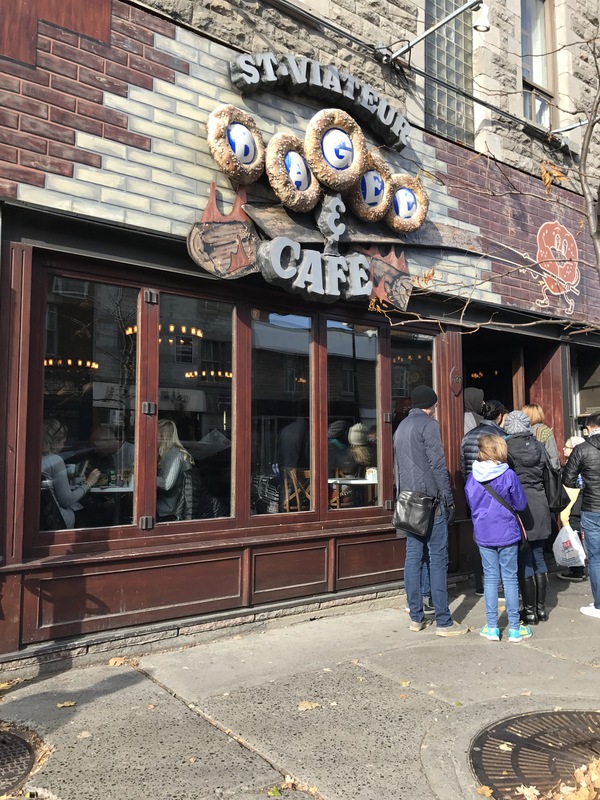 Montreal bagels differ from New York style bagels by being smaller, thinner, sweeter and baked in a wood-fired oven. Joe got a classic bagel sandwich with cream cheese, lox, tomato, capers and onions and I opted for simply a whole wheat bagel with chive cream cheese. Every morning for the rest of the trip, it will be a tough decision between a french croissant and a montreal bagel! Once we finished at St Viateur, we walked down avenue du Mont-Royal and caught a bus to the Parc du Mont Royal. This park was enormous and was at the top of a small mountain. 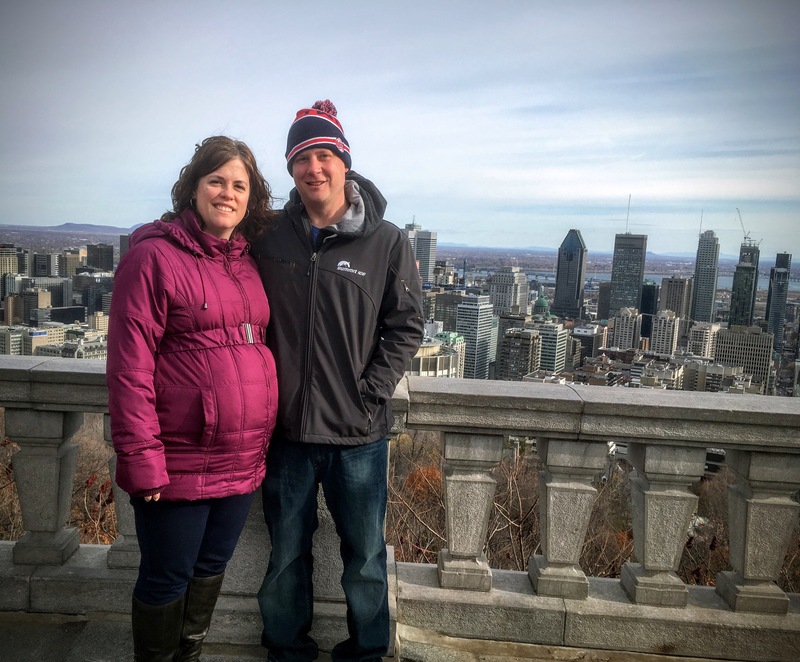 We spent the next couple hours hiking through the park and taking in the views of the city from Mont Royal. Like yesterday, the weather wasn’t too chilly until the wind started blowing. Once we were sufficiently tired and chilled from the hiking, we caught the bus back down to the Le Plateau-Mont Royal neighborhood. We walked around a bit more and were planning to go to Schwartz’s Deli for some smoked meat, a signature Montreal food we learned of while here. To none-deli connoisseurs (like me), smoked meat is very similar to corned beef or pastrami. To the connoisseurs, I’m sure there are very important differences between each. Schwartz’s Deli was specifically recommended to us by a Canadian friend. We got to the deli around 3:00 and figured that would be a great off-peak time to grab a sandwich. We were surprised to see a line out the door and down the block. It was quite windy at this point and we were ready to warm up, so standing in a long line did not appeal to either Joe or me. So instead we back-tracked to a ramen restaurant we passed on our way. 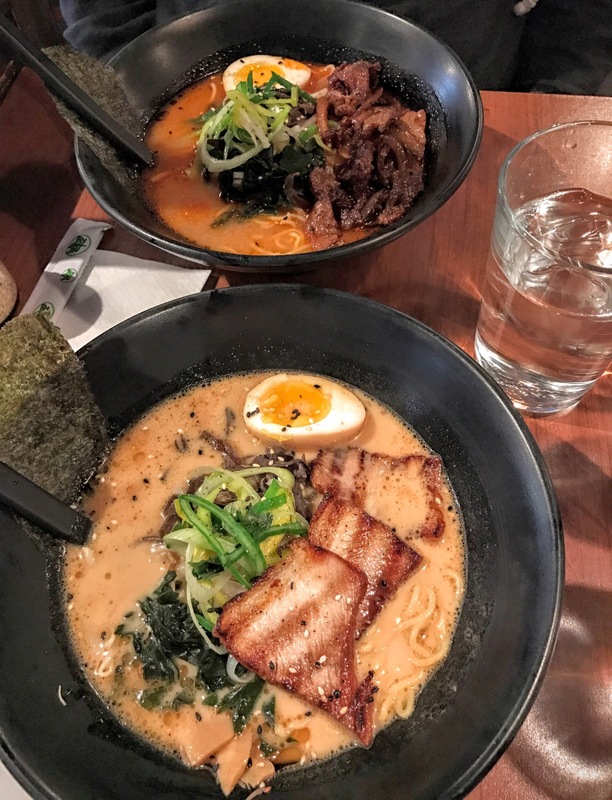 I realize ramen is neither Canadian nor French, but it is one of both Joe’s and my favorite foods and was perfect for our circumstance as we had worked up an appetite hiking and were looking to warm up! The ramen was hearty and just what we were in the mood for. After filling up on ramen, we took the bus back to our hotel for a rest – another one of my favorite parts of vacation. As the evening began, neither Joe nor I were up for a lot of food or activity. But we still wanted to do something Canadian. And neither of us had gotten the craving for smoked meat out of our minds (we will probably attempt Schwartz’s deli again before we leave). 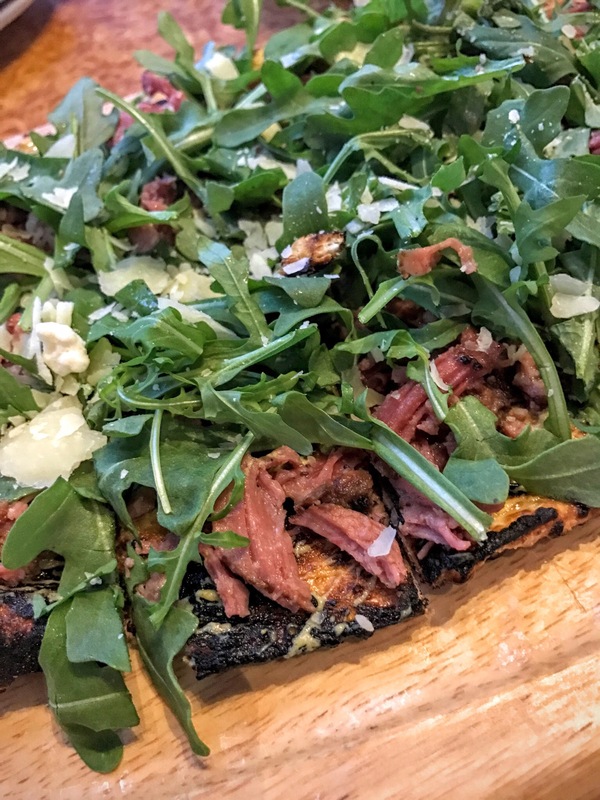 So we found a sports bar in the neighborhood where we watched the Montreal Canadians beat the Detroit Redwings in hockey and we enjoyed a smoked meat and arugula flatbread for dinner. The meat was rich and flavorful, and the grilled bread and arugula kept the dish light. Today was another successful day of exploring and eating our way through Montreal. Tomorrow I have got my eye on finally trying some authentic poutine! It’s hard to believe we haven’t been to another country since our time in Italy, over 2 years ago! With another baby on the way, Joe and I decided to take advantage of the opportunity to get away for a babymoon. We both wanted to explore a city that we had never been to and although overseas somewhere would have been exciting, I wanted to find a shorter flight being 6 months pregnant. So we chose Montreal. The timing is ironic with the presidential election just a few days ago. We aren’t truly looking to move to Canada, but it does feel good to escape everything happening in our country right now. After a short flight (under 2 1/2 hours! ), we landed in Montreal shortly after 11pm. We checked into our hotel and went right to bed so we were well rested to start our first full day in the city. 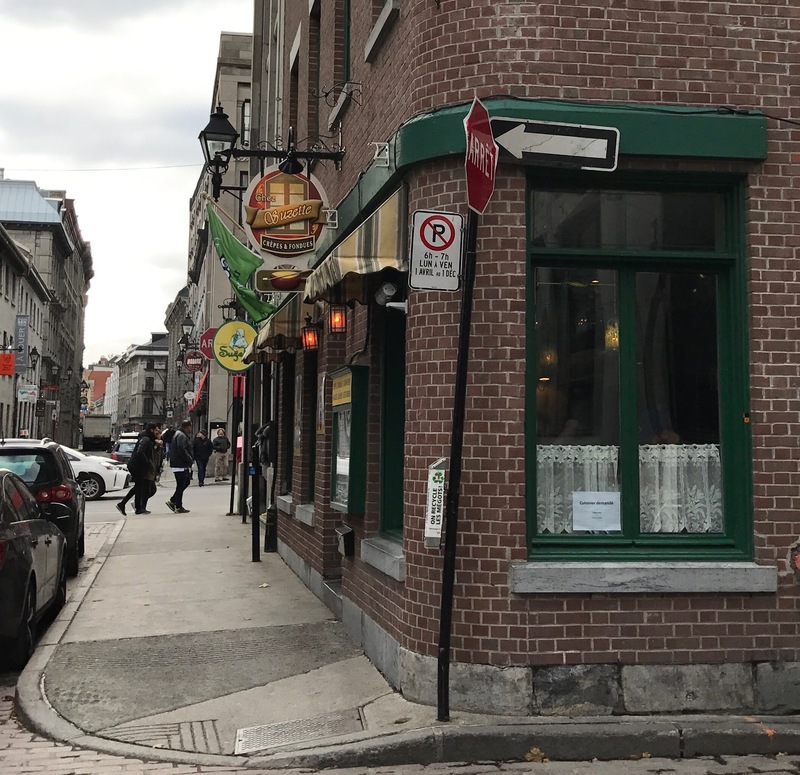 We are staying in the Old Montreal neighborhood and it is incredible how close this is to home, yet feels so European. I knew people spoke French in Quebec, but I didn’t realize how heavily the French culture influences this area. 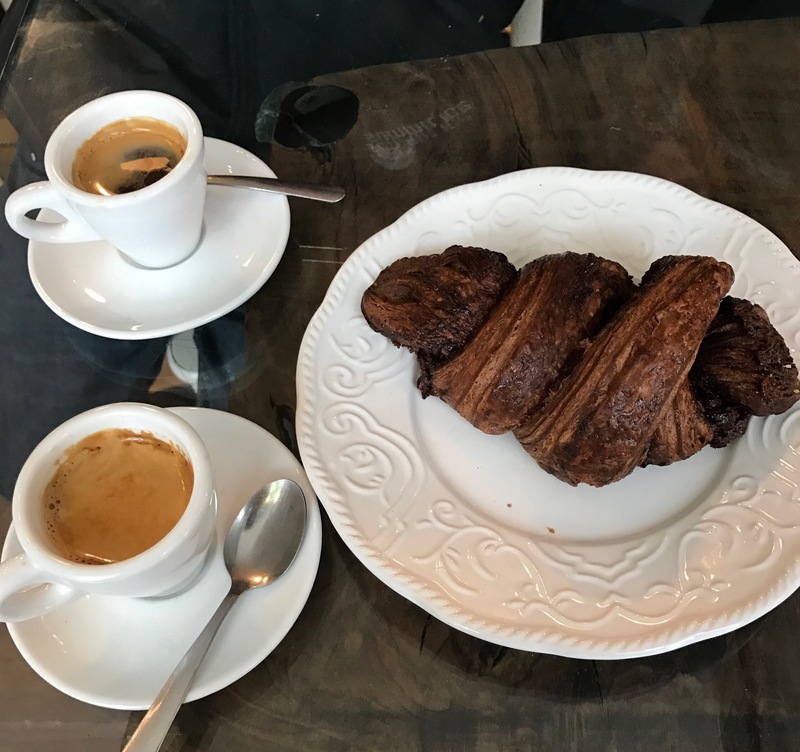 I had been thinking of Canadian cuisine I would want to try leading up to the trip, but hadn’t thought about all of the French cuisine we would enjoy. We started with a light breakfast in the hotel, then got outside to start exploring our neighborhood. After a nice walk, we returned to the hotel to get ready for the day and then officially ventured out. By this time I was ready for a snack, but not quite ready for lunch. So we found a cafe called Bar a Beurre (translates to Bar Butter) and enjoyed a nutella croissant and an espresso. There are a lot of things that are hard to forego eating or drinking while pregnant, but decaf espresso isn’t disappointing. It tastes just as good as the real thing (versus a non-alcoholic beer, for instance). So it is a treat I will enjoy every day that we are here. 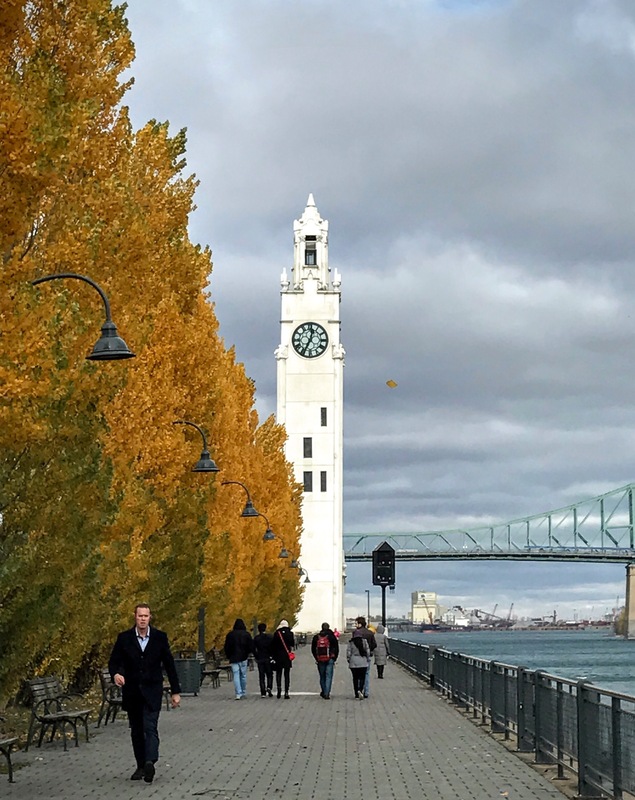 After our croissant break, we continued to walk around Old Montreal and explore the neighborhood. Even though we are well into November, there were still some nice fall colors to enjoy. And the temperature generally wasn’t too cold, though it did get quite chilly from the wind as we were walking by the water. By the time early afternoon rolled around, we were ready to warm up with some lunch. We found a cute little restaurant called Chez Suzette. 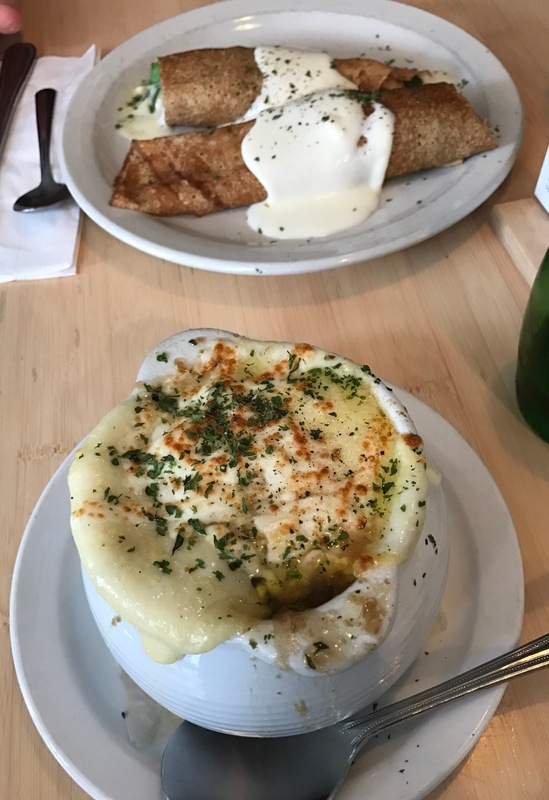 Joe and I split a baked french onion soup and the crepe la charlevoix, which was a crepe filled with ham, swiss and spinach and topped with a bechamel sauce. 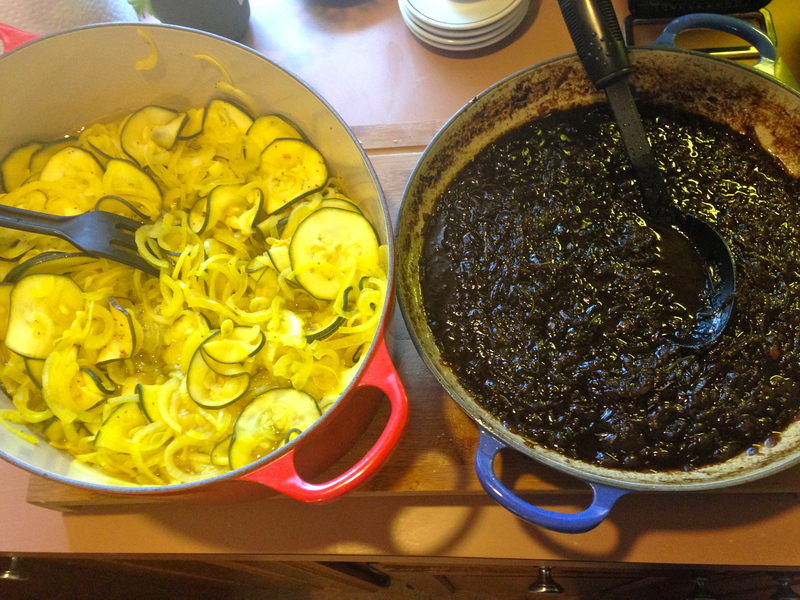 It was rich and comforting and just the right amount for lunch. 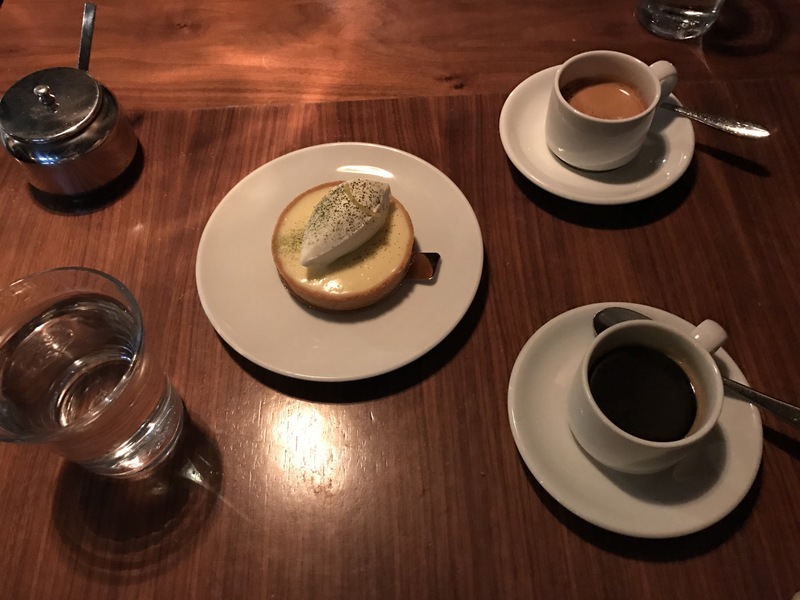 We did not do a lot of planning ahead for our trip to Montreal, so I figured our chances of getting into any extraordinary Montreal restaurants would be impossible. 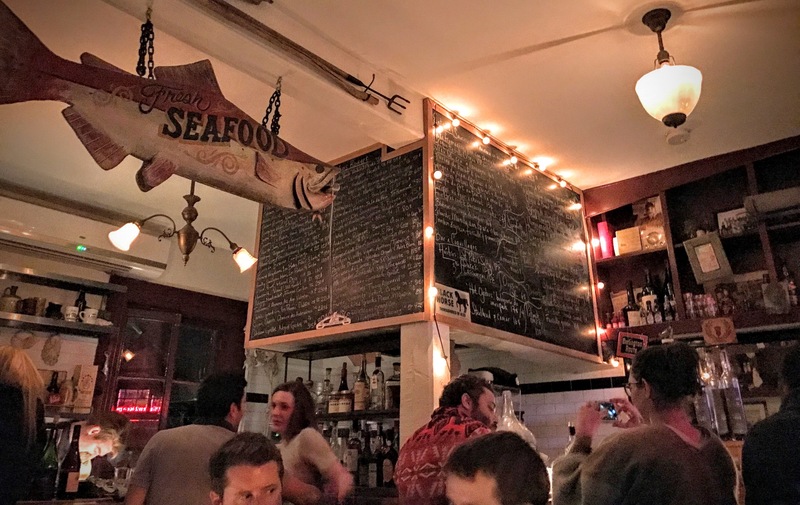 One restaurant I began hearing a lot about is called Joe Beef. And sure enough, when I looked for a reservation they were booked out as far as you could see into the future. However, their website referred me to a wonderful app called DINR that would notify me if a reservation became available. And sure enough, as we were walking around this afternoon, I got notification that an 8:15 reservation became available and I was able to grab it! After another rest at the hotel, we grabbed a taxi around 5:00 and headed down to the Little Burgundy neighborhood, where Joe Beef is located. This neighborhood is more modern and felt more like Chicago than Europe (though French was still very prevalent). 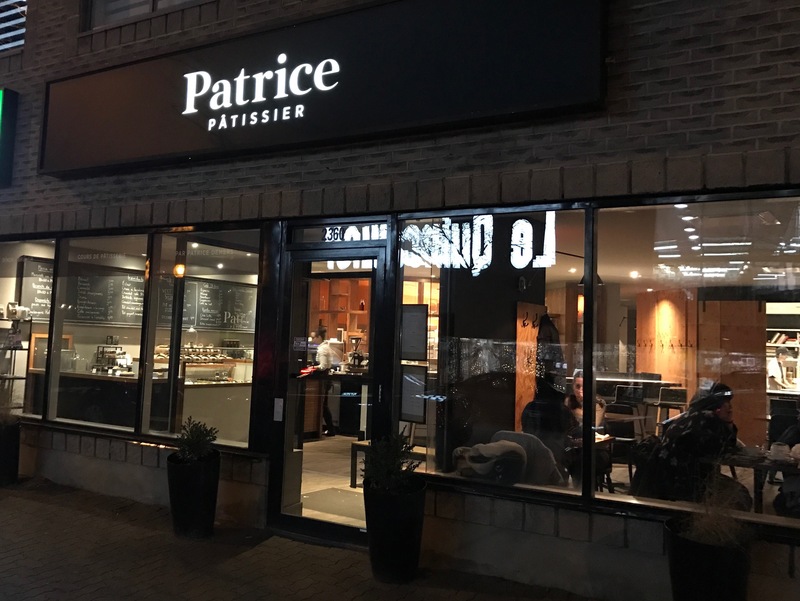 We had a few hours to kill before our reservation and I was already starting to feel hungry again, so we stopped at a place called Patrice Patissier for an afternoon dessert and a couple more espressos. I chose a creamy tart made with lemon, yuzu and topped with a whipped cream infused with tarragon. It sounds a little bizarre, but it was so good! The texture of each component was impeccable and the flavors were balanced perfectly (the tarragon was extremely subtle). Finally 8:15 rolled around and it was time for dinner at Joe Beef! We ate an enormous meal and the restaurant did not disappoint! The restaurant is a small space and less formal than you would expect for this caliber of food. The service was excellent. The menu simply exists on a chalkboard with small writing, all in French. Our server took the time to walk us through every single dish on the menu in great detail. Note: it was extremely dark inside the restaurant, so the pictures aren’t the greatest quality. 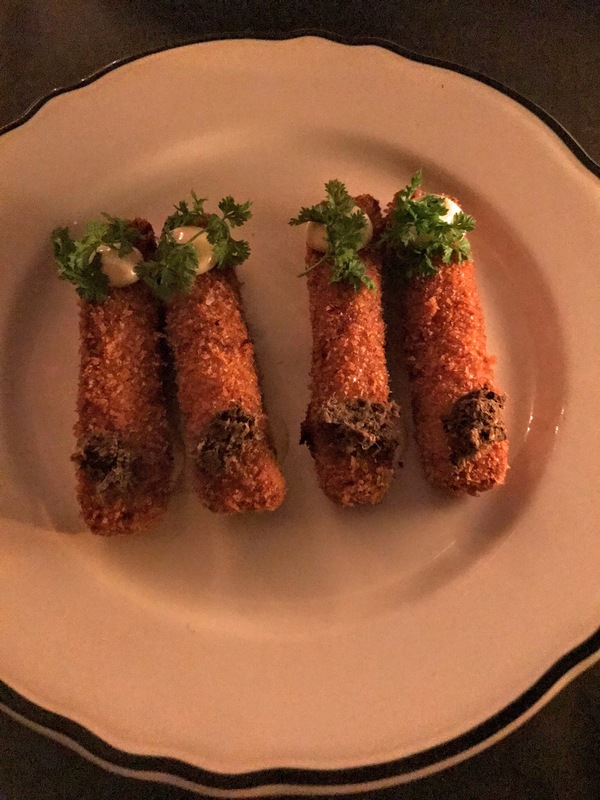 To start we ordered croquettes with croque monsieur filling and truffle and the manila clams with short ribs. The croquettes were delicious bites of indulgence, though a bit lighter than I expected (which was great with all the food we had coming!). 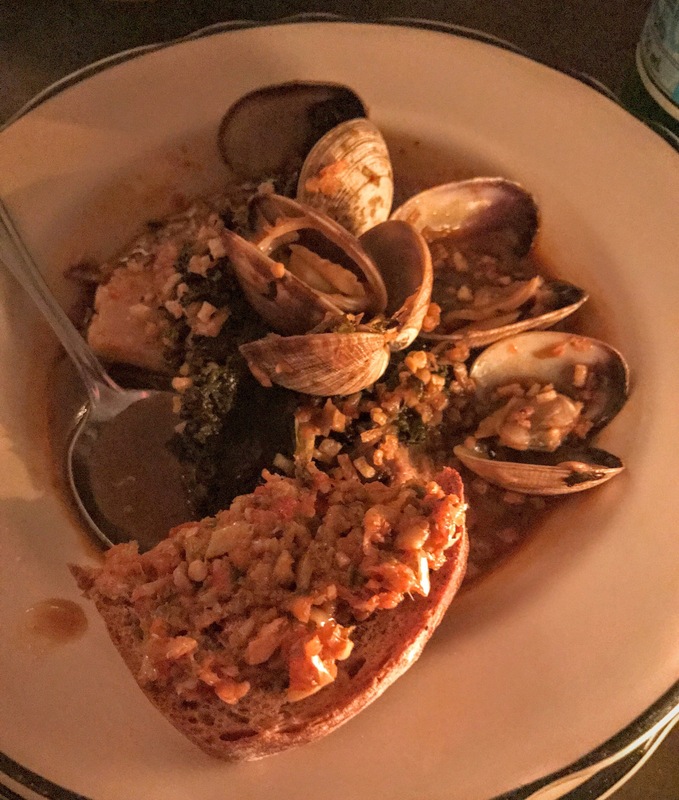 The clams on the other hand were heavier than I expected, but I kept describing them as a big bowl of yumminess. The broth was super rich, the short rib meat was extremely tender yet didn’t overpower the flavor of the clams. It was a serious bowl of comfort food! Joe declared the clams his favorite dish of the night. For our main courses, we ordered the rabbit and the lobster spaghetti. 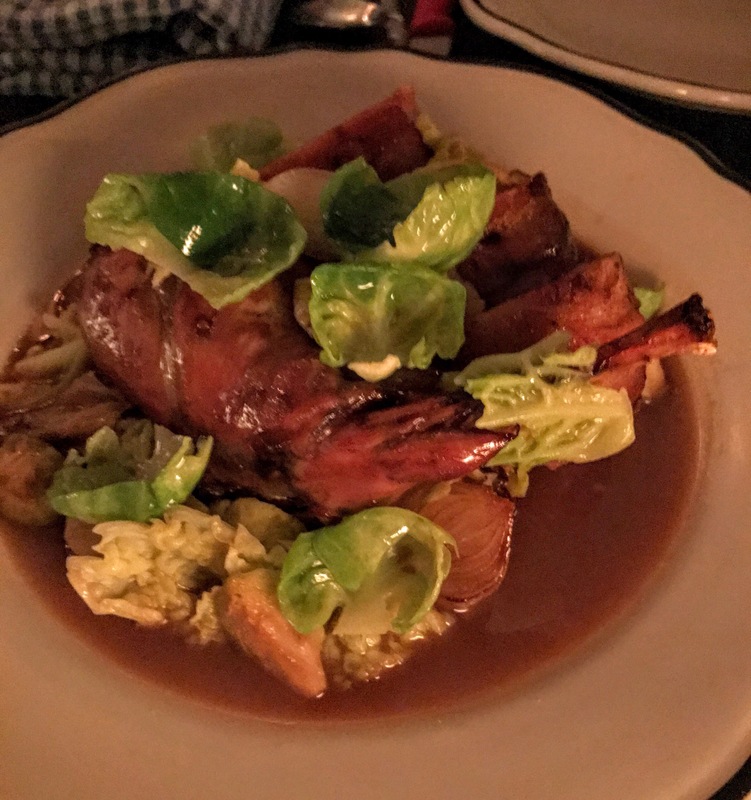 The rabbit came prepared two ways: the leg meat was cooked on the bone and on the side was a roulade presentation with the meat rolled around rabbit sausage. It was served with three types of cabbage (savoy, tuscan and brussels sprouts) and another rich broth-like sauce. The technique on the roulade was impeccable and the rich meat and braised cabbage were a perfect combination. 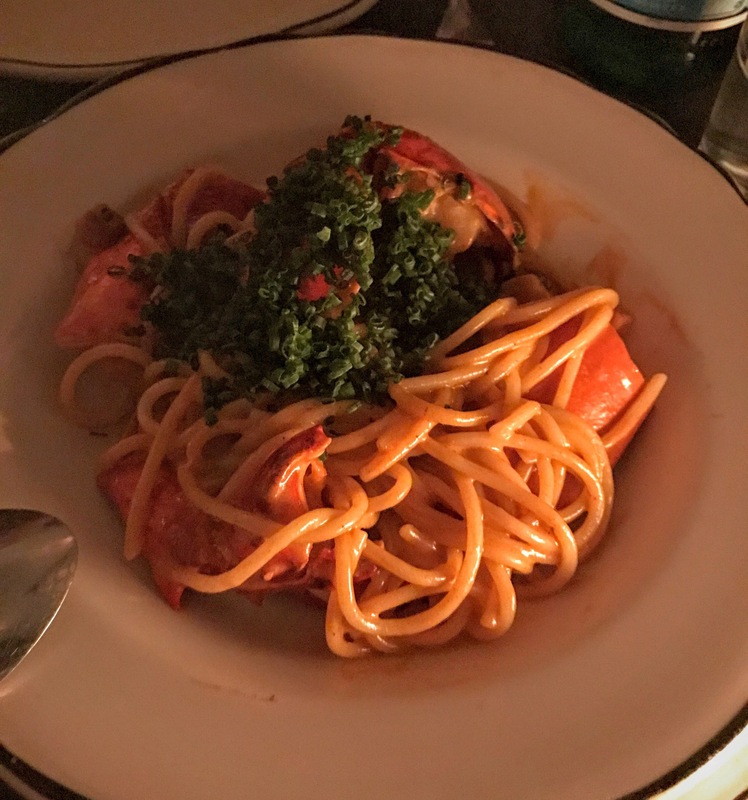 The lobster spaghetti was another rich and wonderful dish. It was a fresh spaghetti and the texture of the pasta was the perfect chewiness. The sauce was rich and flavorful, but not overly creamy. And the lobster meat was tender and definitely the star of the dish. We ordered the half portion which came with half of a lobster. 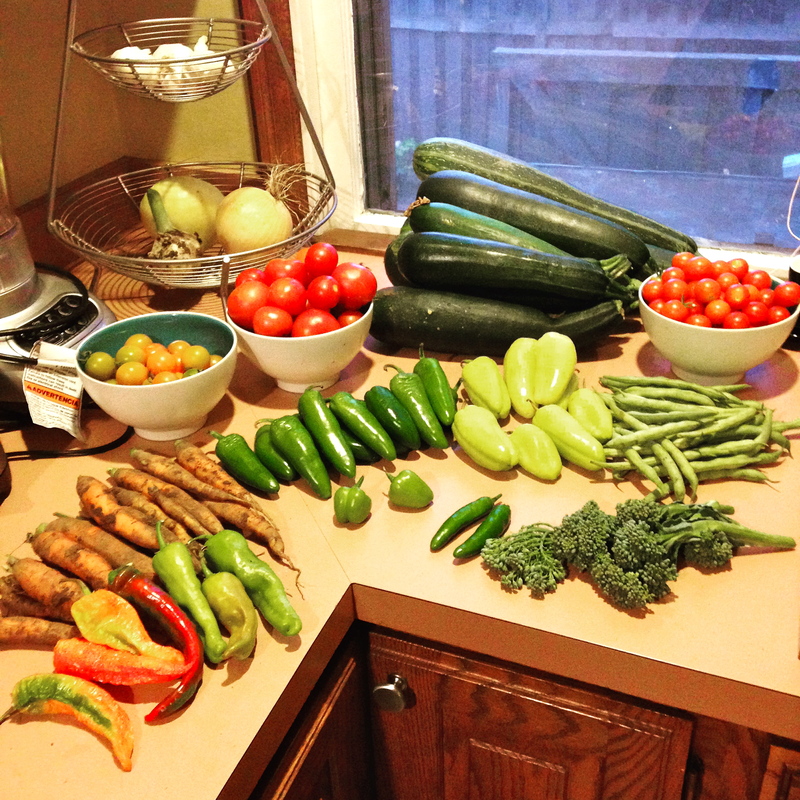 It was still plenty of food! The half portion wasn’t listed on the menu, but our server suggested it so that we could try an extra dish. I’m glad she did. Having said that, the lobster spaghetti was my favorite dish of the night. Somehow after all of this food we decided to order dessert (perhaps I used being pregnant as an excuse). We ordered the server’s favorite, a pear and chocolate tart. It was really big and we didn’t finish it, but it was lighter than expected. 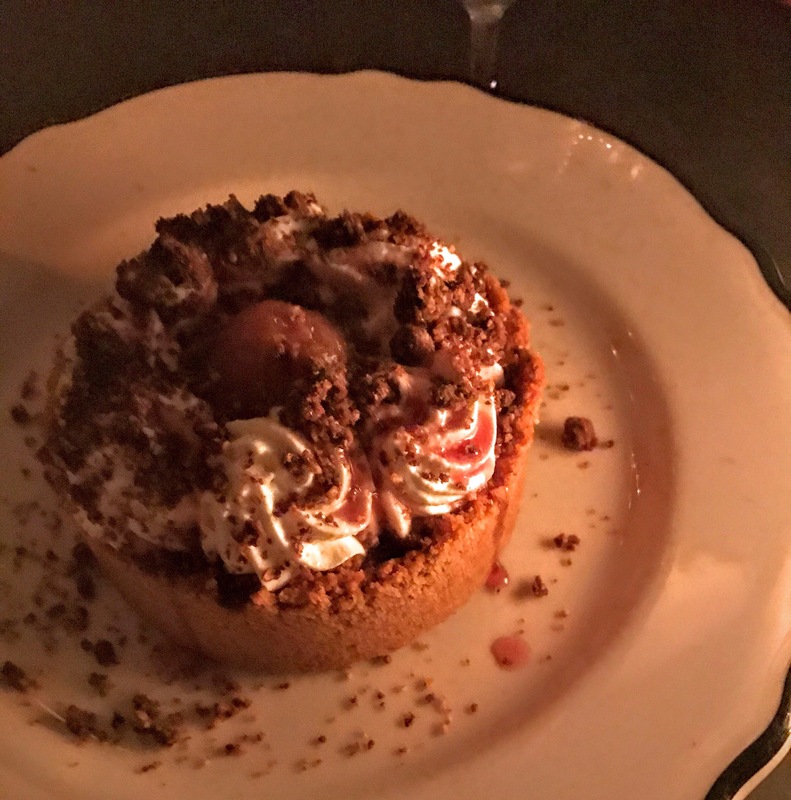 The crust was very light and flakey and had a braised pear in the center which was surrounded by a light chocolate mousse and whipped cream. It was a wonderful and not overly-sweet end to the meal. 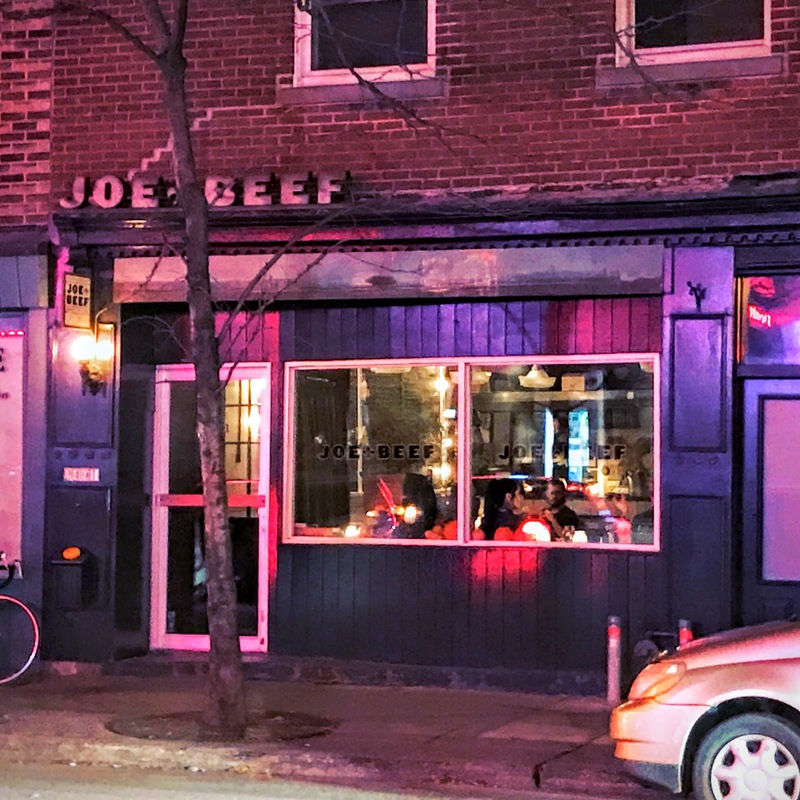 I highly recommend Joe Beef to any visitors to Montreal! We really started our trip off on a good foot! I worry it will be downhill from here. But hopefully not. We still have Montreal bagels, poutine, all things maple and several parts of the city left to explore! The first week was a fabulous week for the Vikings! At the beginning of the season, people had high hopes for the Rams and low hopes for the Vikings, so when we beat the Rams on the road, it was very exciting to watch. There is no better drink for football in my opinion (outside of beer) than a bloody mary. 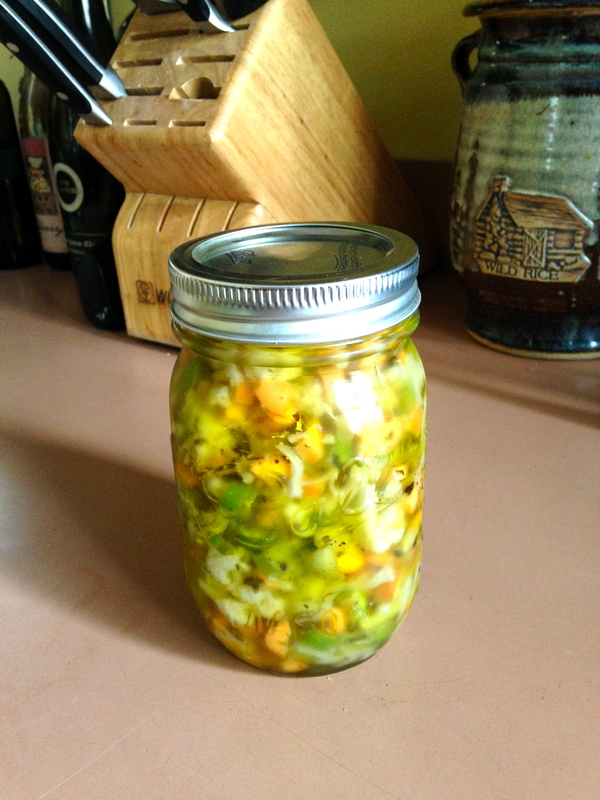 And when I make them, they are pretty much an appetizer and drink rolled into one. I love the fixings that go along with the drink! 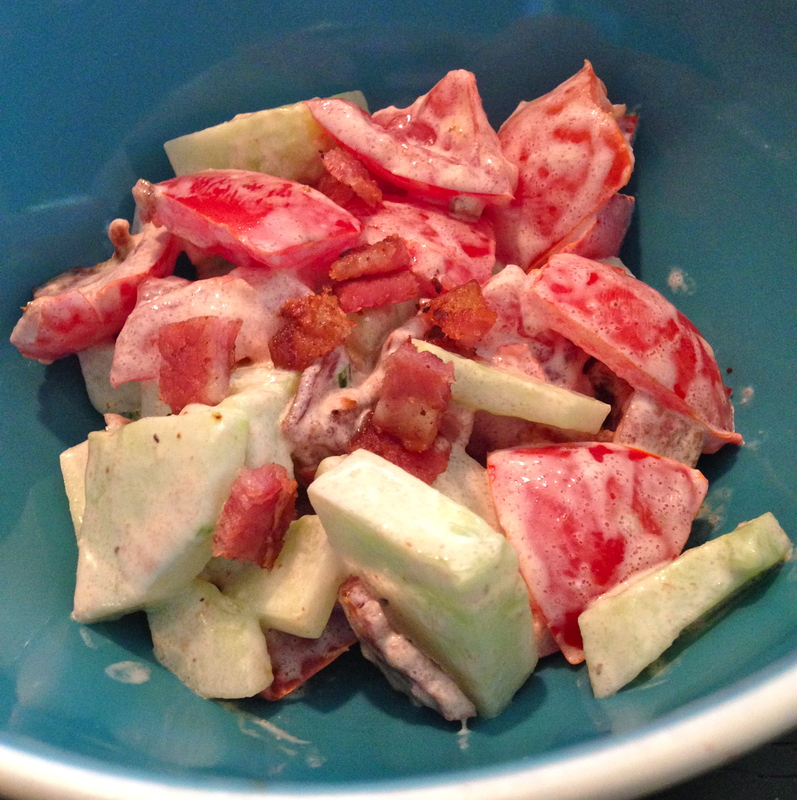 We enjoyed celery, bacon and a skewer of salami, cheese, pickles and olives. 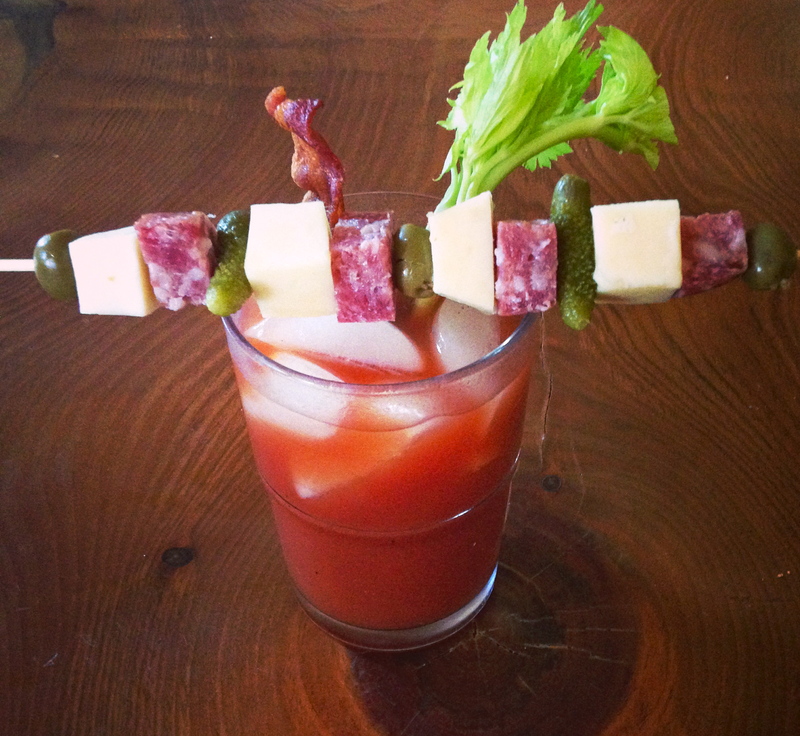 I think of it as an antipasti bloody mary and it’s a true combination of Italian and Midwestern! 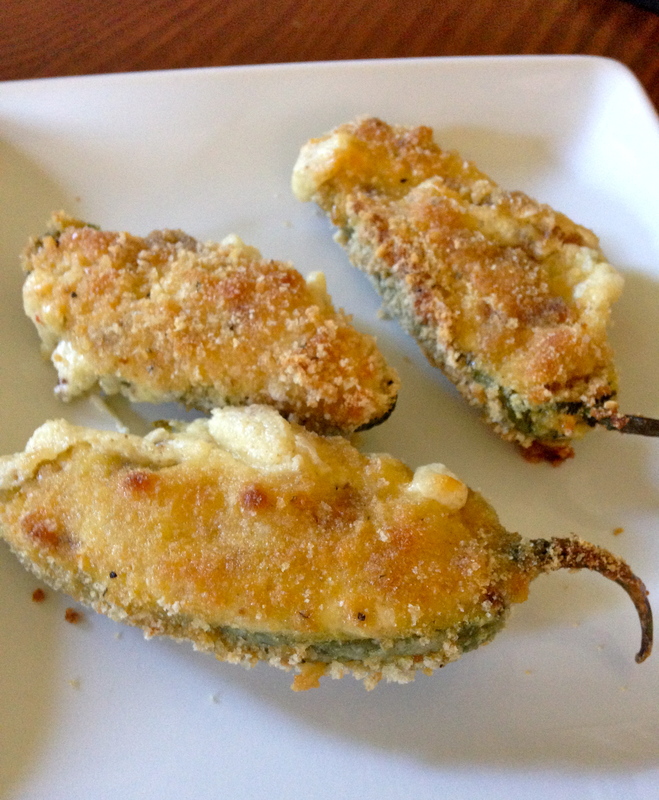 Next I made baked jalapeno poppers. 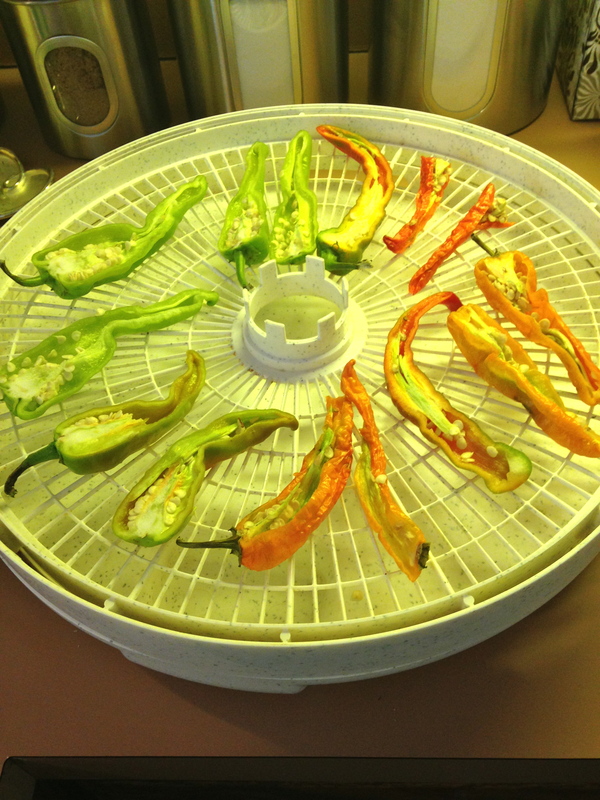 I stuffed the peppers with a mixture of cream cheese and shredded pepper-jack. 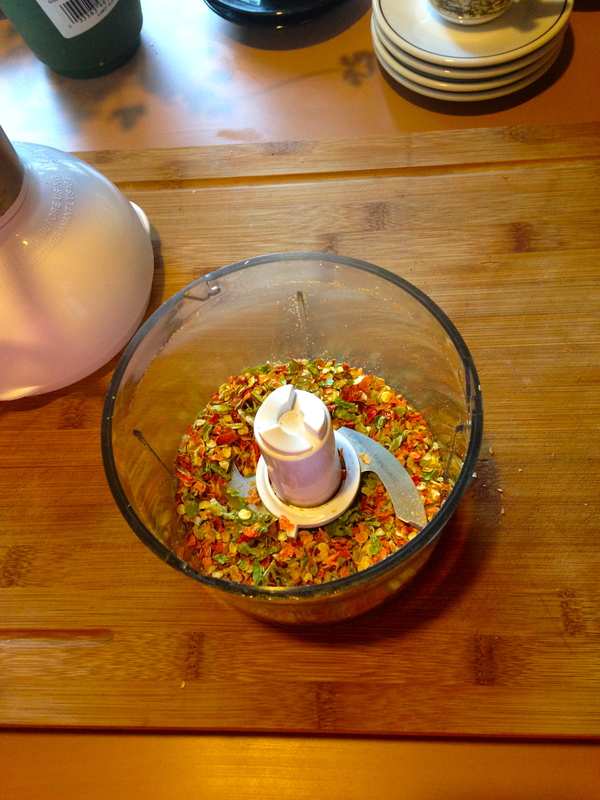 I then rolled the stuffed peppers in flour, then eggs, then breadcrumbs. I put them on a foil-lined baking sheet and baked them at 350 for about 30 minutes. They turned out beautifully crispy and gooey in the center. It was my first time attempting to make these at home and I can say they were a hit! 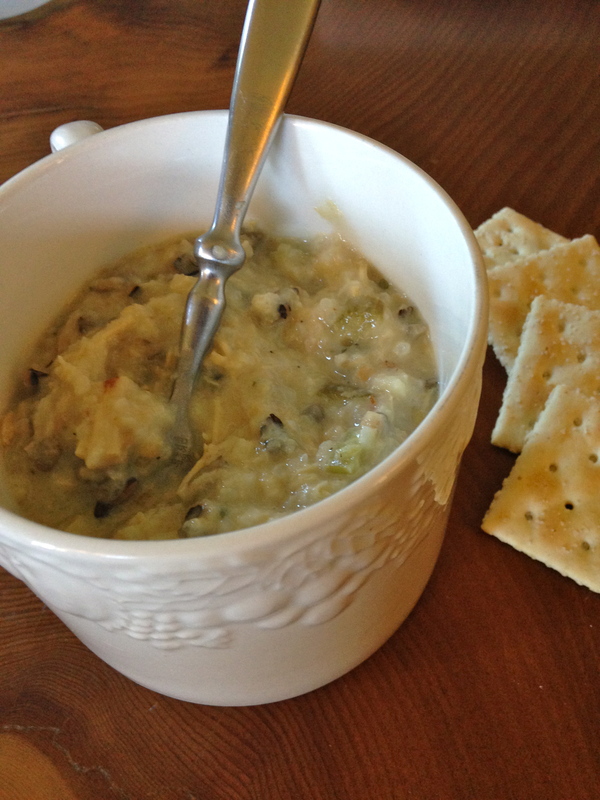 Lastly, we enjoyed a true Minnesota staple: cream of chicken and wild rice soup. This is probably a dish that I will make my own recipe for and post on the blog one day, but this time we had been given frozen, homemade soup from my mom. 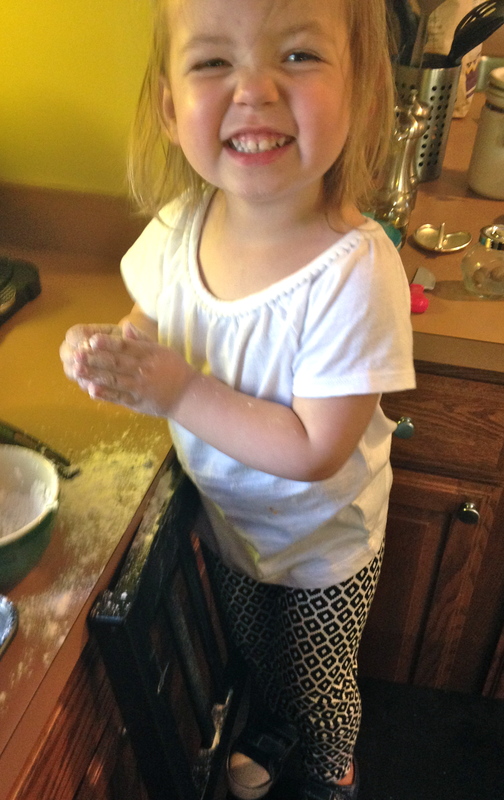 So we simply reheated and enjoyed her home-cooking. It is one of my absolute favorite soups and is so creamy and comforting! 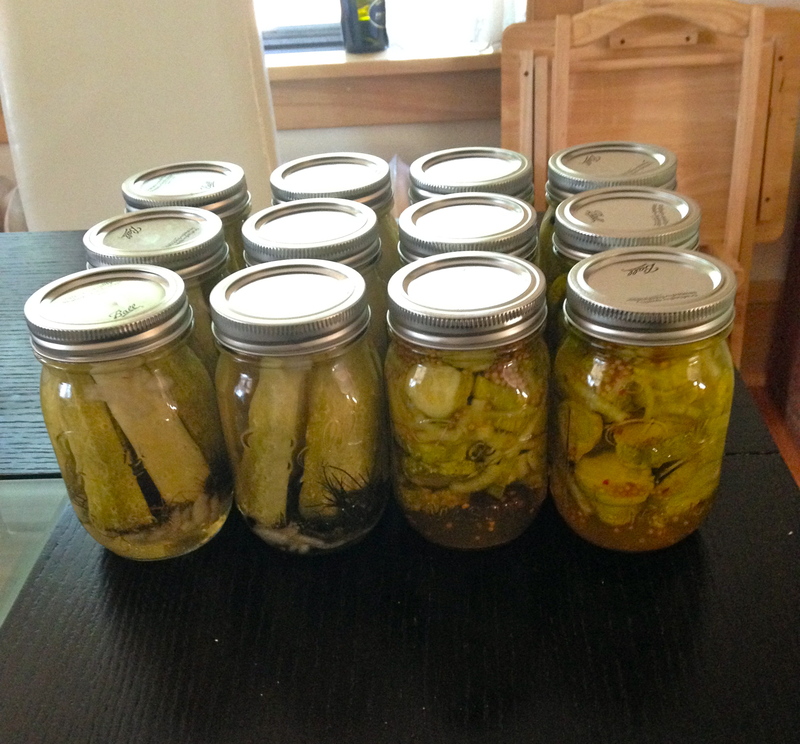 We went into week two cautiously optimistic. It was our home-opener against the New England Patriots. The Patriots really didn’t look very good in week 1, so we were hopeful we might actually have a chance of beating them. That hope didn’t last long as they beat us 30-7. We enjoyed this week of football (in spite of the loss) up at Joe’s parents’ cabin near Ely, MN. I was going back to work a couple weeks later, so we decided to enjoy a long weekend at the cabin while we still had such a flexible schedule. 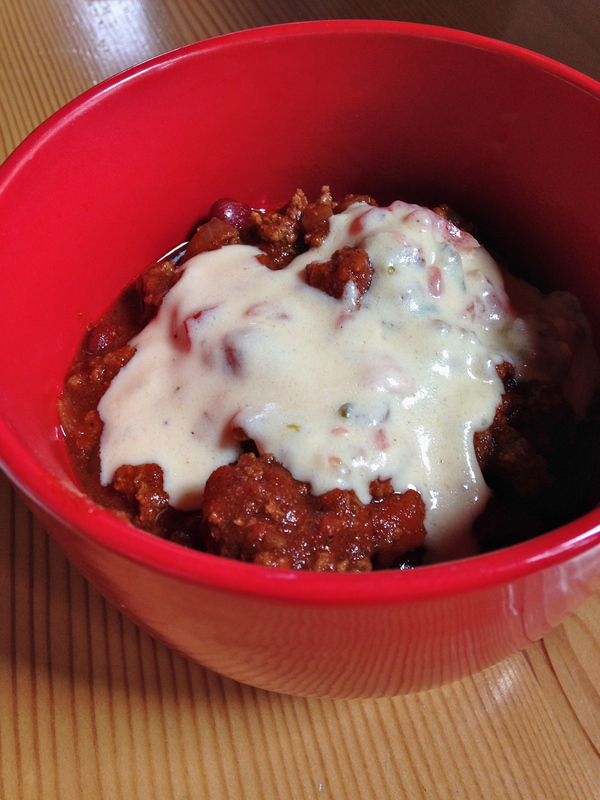 When I ask Joe what his idea of football food is, he always answers with chili. 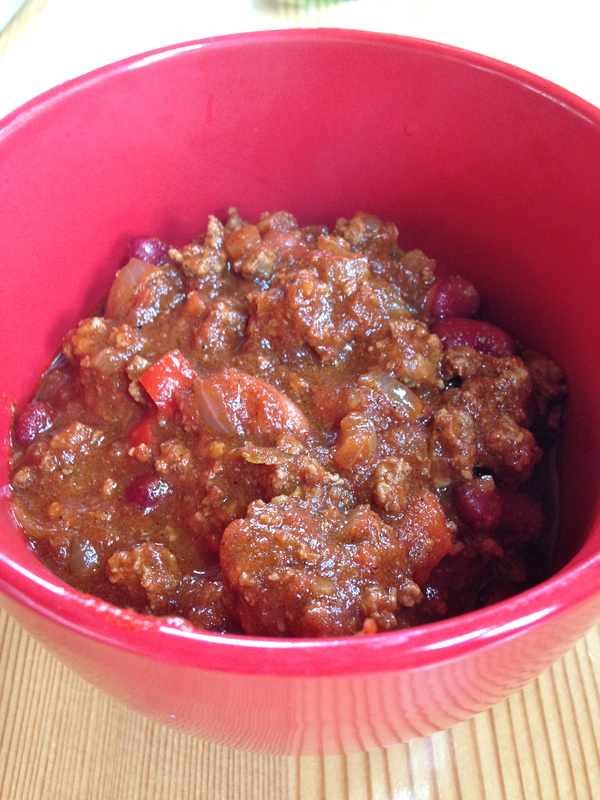 So I made chili. I didn’t do anything earth-shattering here. I just chopped an onion and a red bell pepper and sauteed them while browning some beef. I then added canned tomatoes, canned beans and a packet of chili seasoning and then let it simmer so all of the flavors combined. 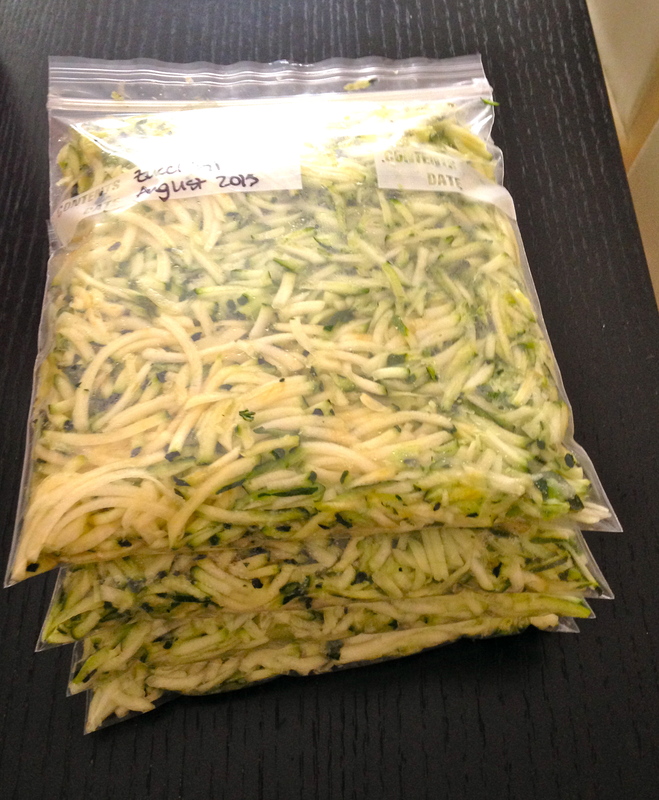 It was extremely easy and turned out very delicious. 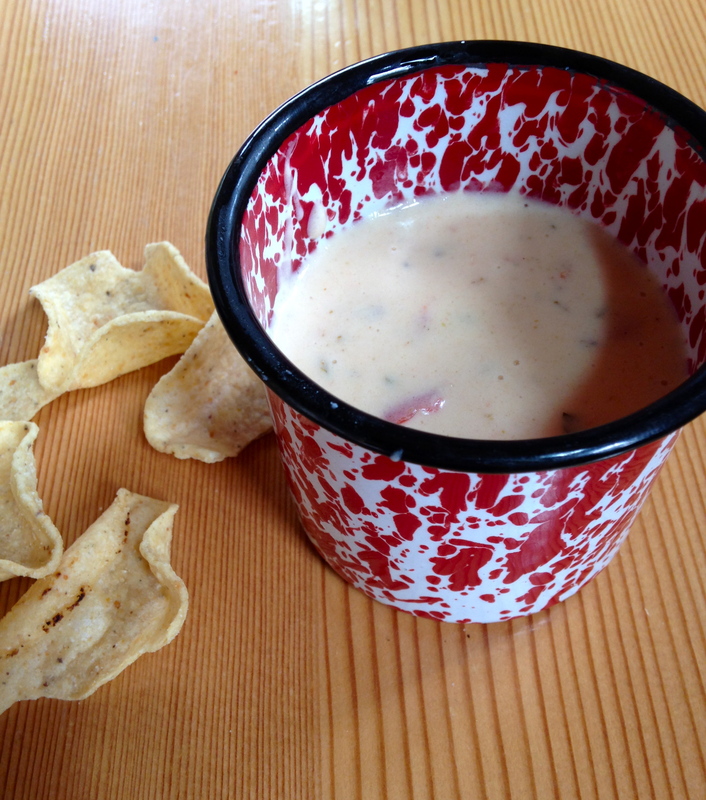 One of my favorite football foods is queso. I decided to make a homemade version that combines evaporated milk with shredded cheese that is tossed with cornstarch. 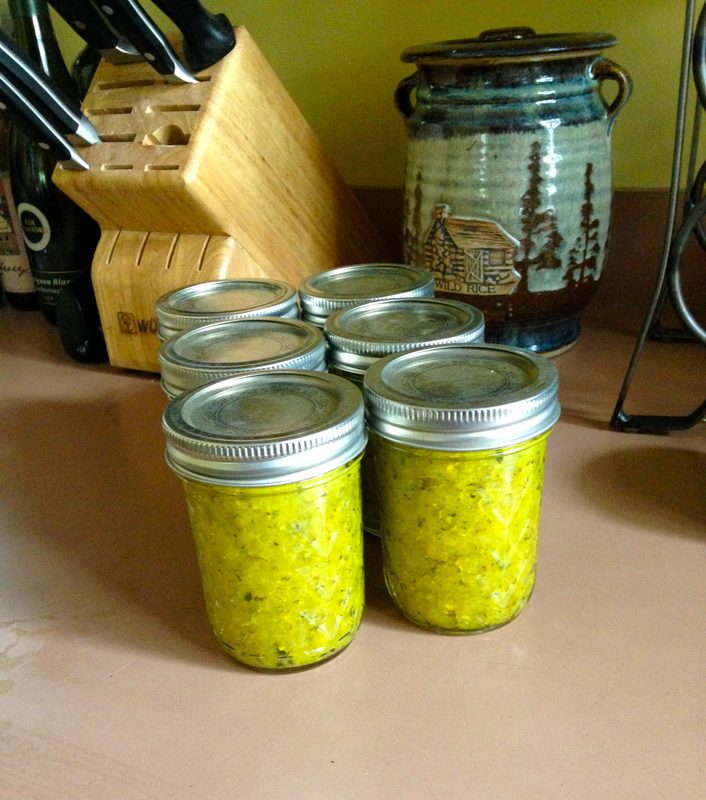 I added a couple cans of drained Rotel and let it simmer until thick. The queso was delicious with chips…. 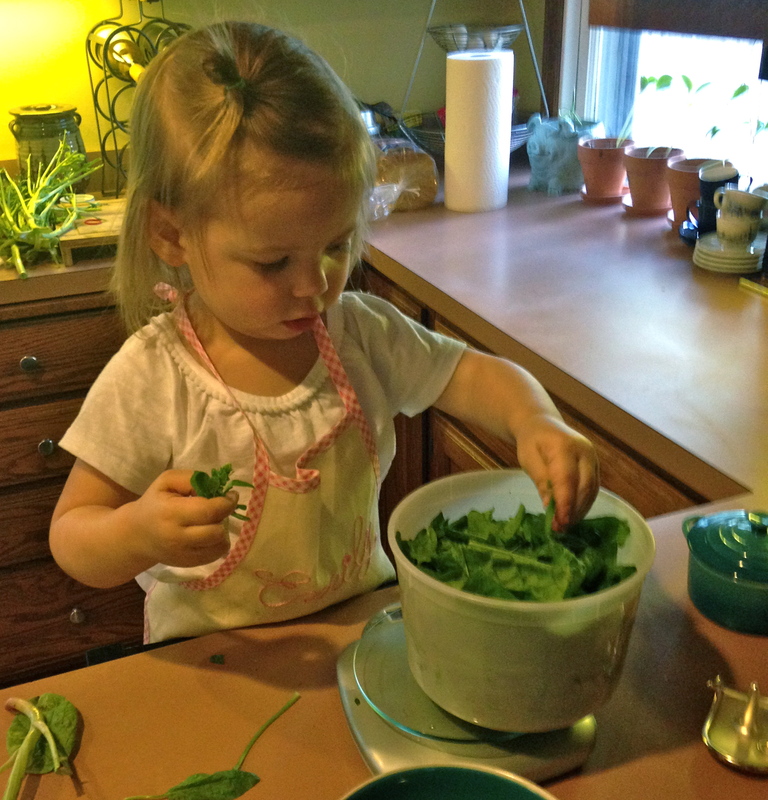 …and we discovered it was delicious on top of the chili! The third week brought a loss from the Saints. Unfortunately, the game wasn’t even very fun to watch. But, Joe & I had fun stopping off at a restaurant along the road on our trip back from a weekend at a cabin up north with friends. 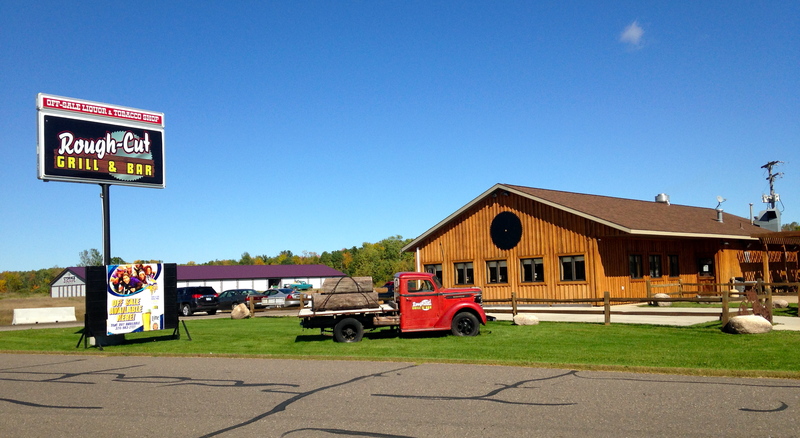 The restaurant we chose was Rough-Cut Grill & Bar in Milaca, MN. We wanted good football food, but didn’t want to be stuffed, so we decided to split an appetizer and a burger. Little did we know, the appetizer we ordered was enormous! It was fabulous football food. 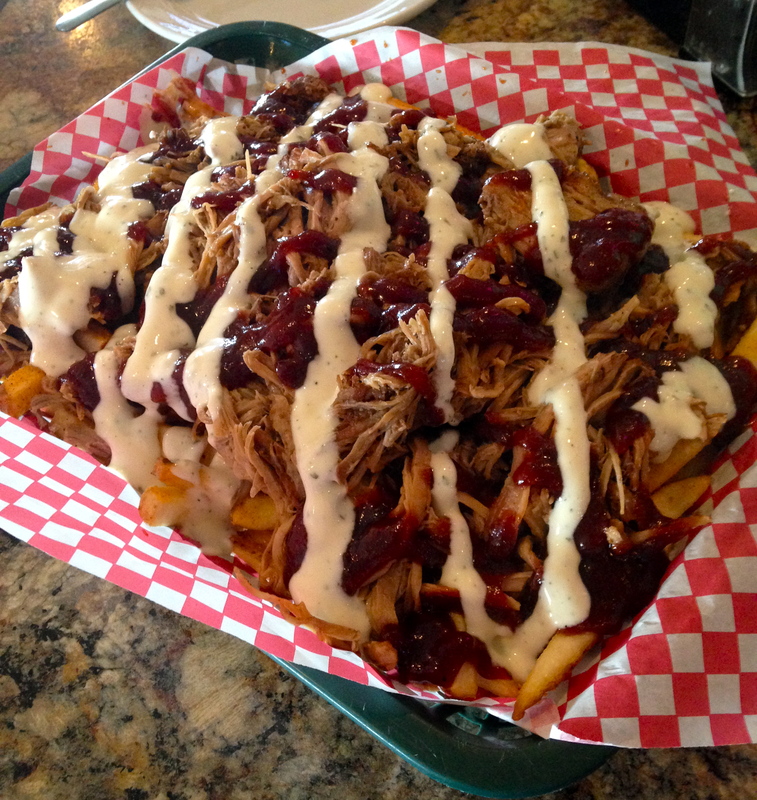 The appetizer was called Smokin’ Pork Fries and was a bed of french fries covered in pulled pork, chipotle barbecue sauce and ranch. Although certainly heavy, the fries were extremely delicious! After packing up 75% of the Smokin’ Pork Fries to go, Joe and I split the mushroom and swiss burger. 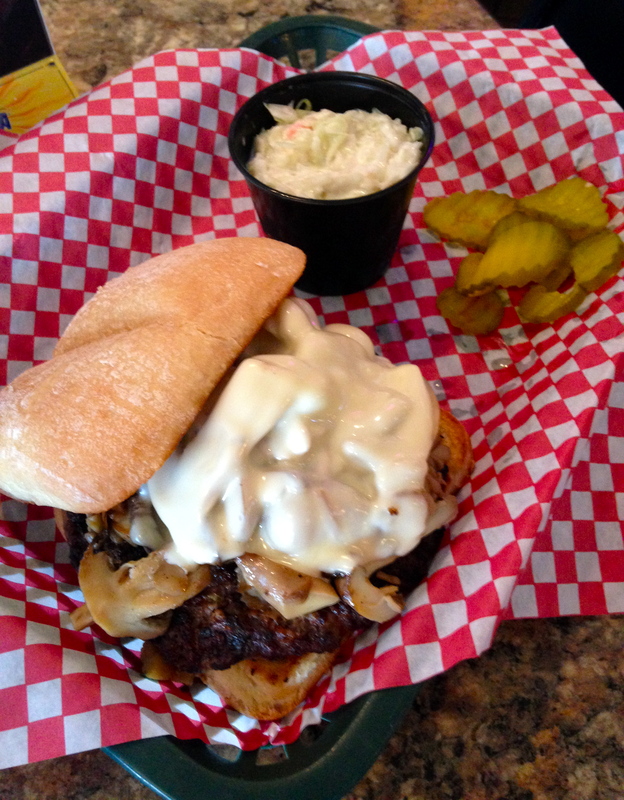 The burger was juicy and flavorful and was served on a tender ciabatta bun. It was a very good meal and I highly recommend stopping at Rough-Cut if you ever find yourself driving on highway 169 in central Minnesota! We got a glimmer of hope in the fourth week when we beat the Falcons 41-28. Unlike the couple weeks before, this was a fun game to watch. In addition to that actual food I like to enjoy while watching football, I love the company of other Vikings fans. 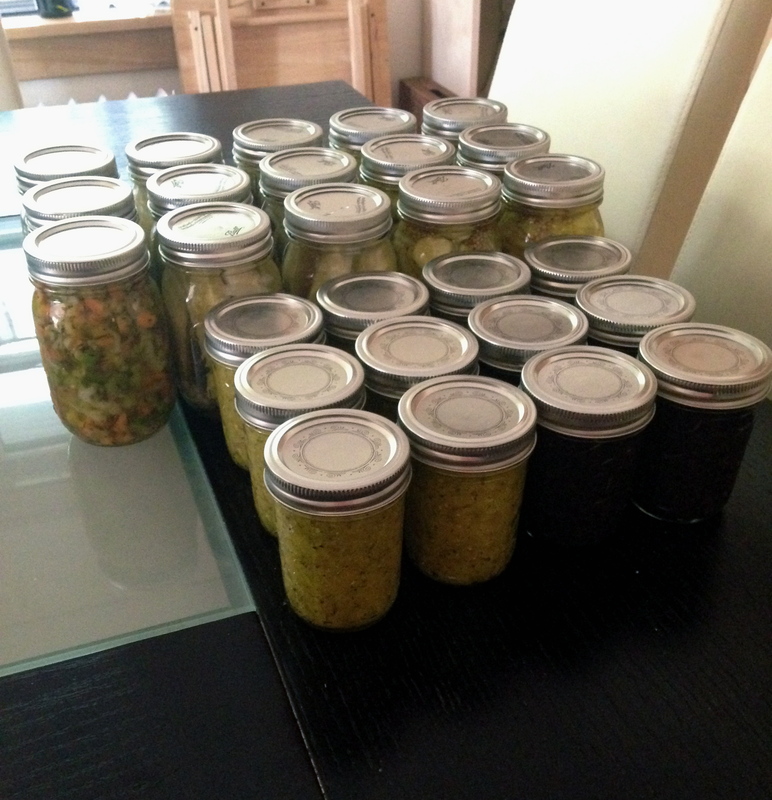 This week I invited my immediate family over to enjoy the game and some food. 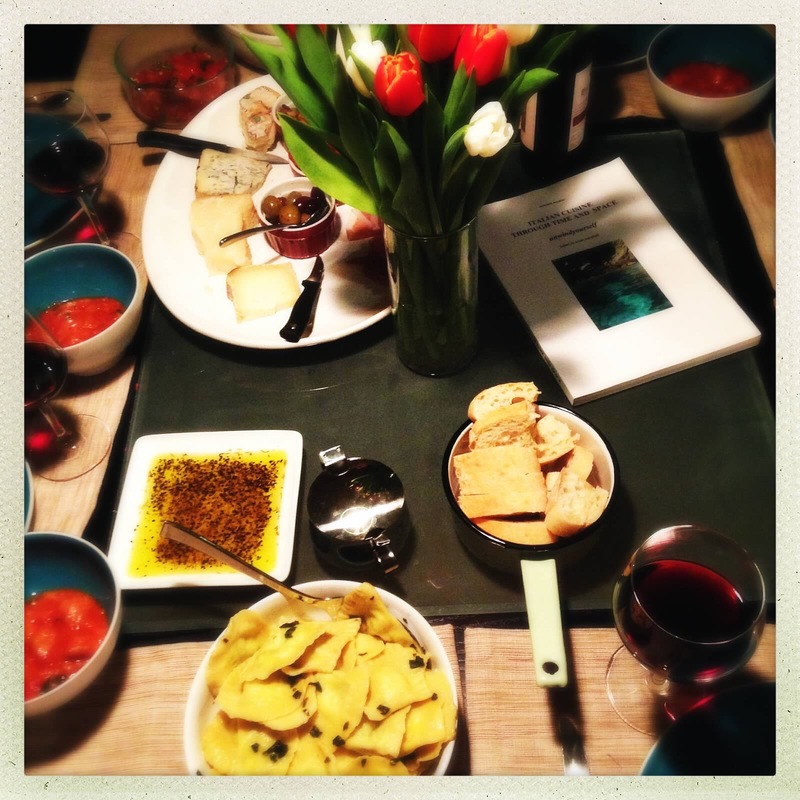 I decided to have everyone bring some appetizers and I would supply a main dish. The main dish I decided to make was Amy Thielen’s Booya-Pozole from her cookbook “The New Midwestern Table.” I always seem to make a couple modifications to a recipe these days, partly to simplify the process based on the ingredients I have available to me, and partly to put my own touch on a recipe. 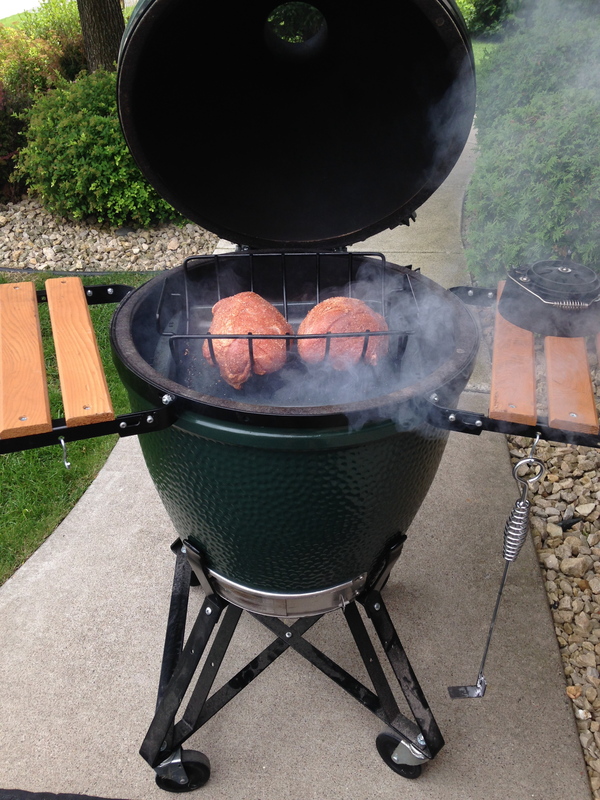 The main modifications I made this time was that I only used pork (the recipe calls for pork and chicken) and I smoked the pork on my Big Green Egg before adding it to the stew. 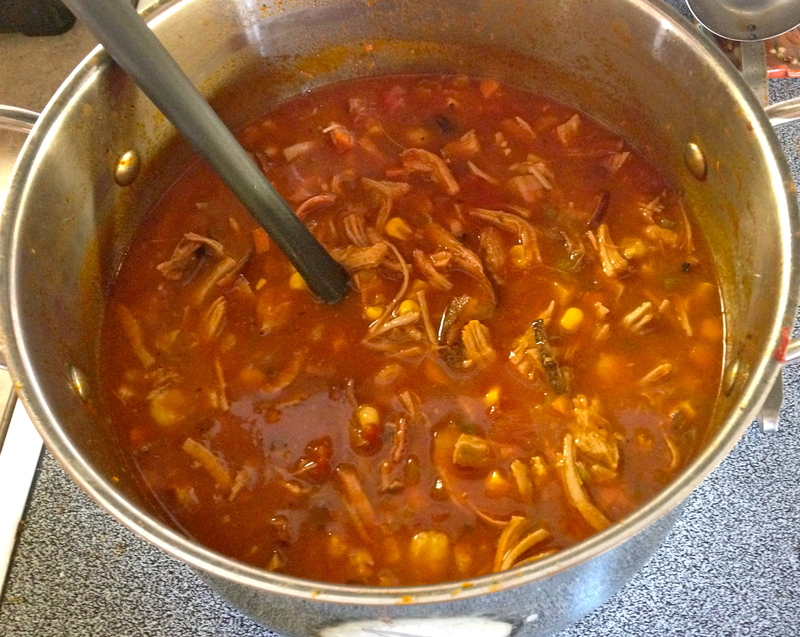 The smoked pork added a wonderfully smoky flavor to the broth. 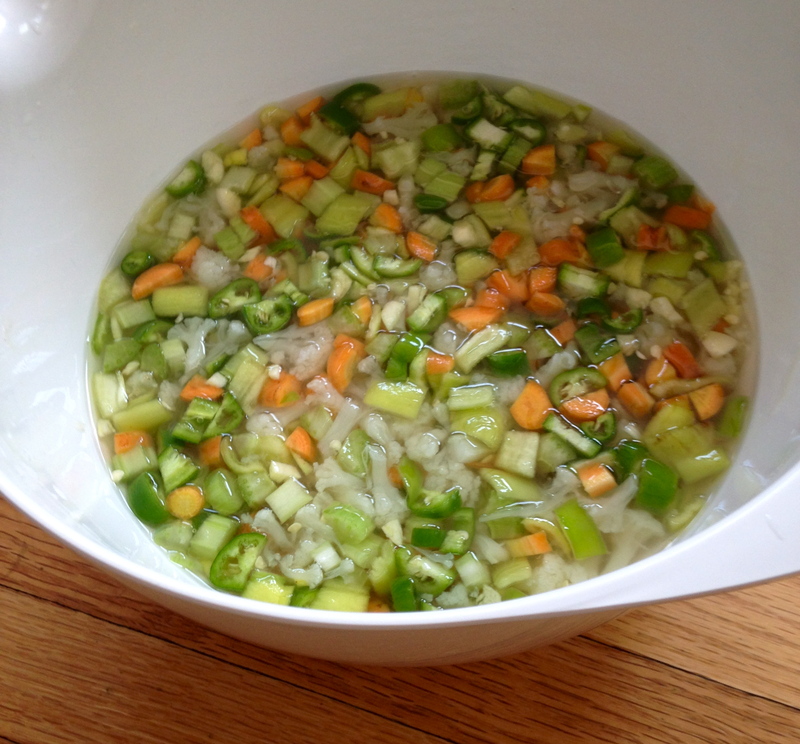 The other main modification I made to the recipe was that I pureed part of the broth with only the vegetables in it to make it a bit of a smoother/creamier soup. 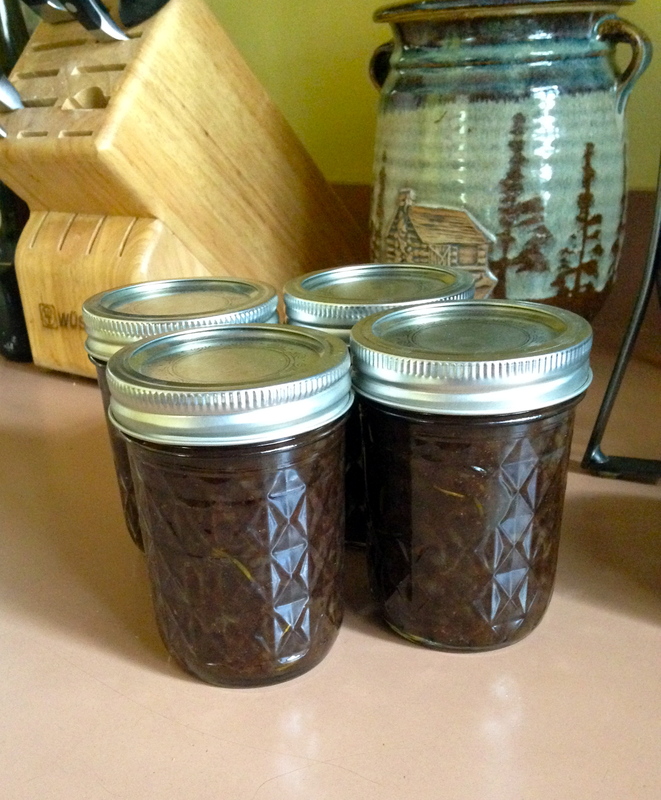 But this recipe is truly wonderful as it is. 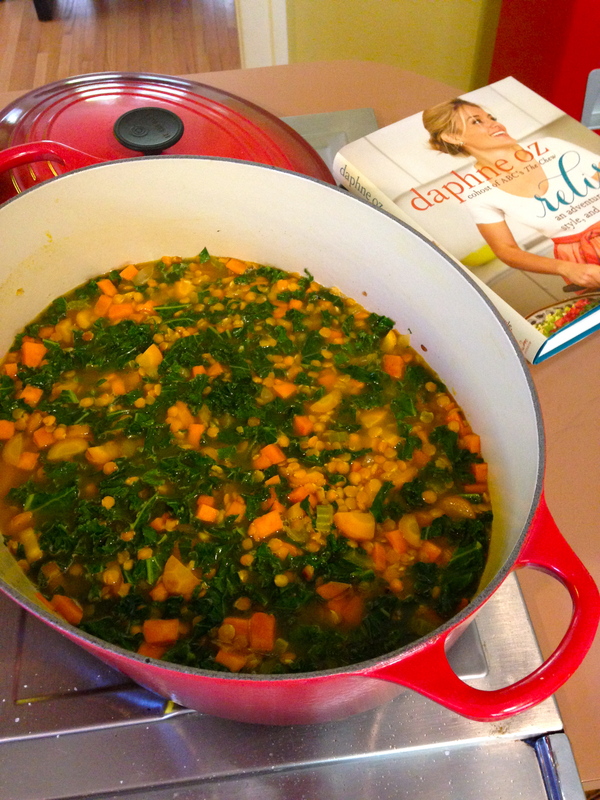 It takes some time to prepare, but it is so hearty and wonderful, it is well worth the effort. 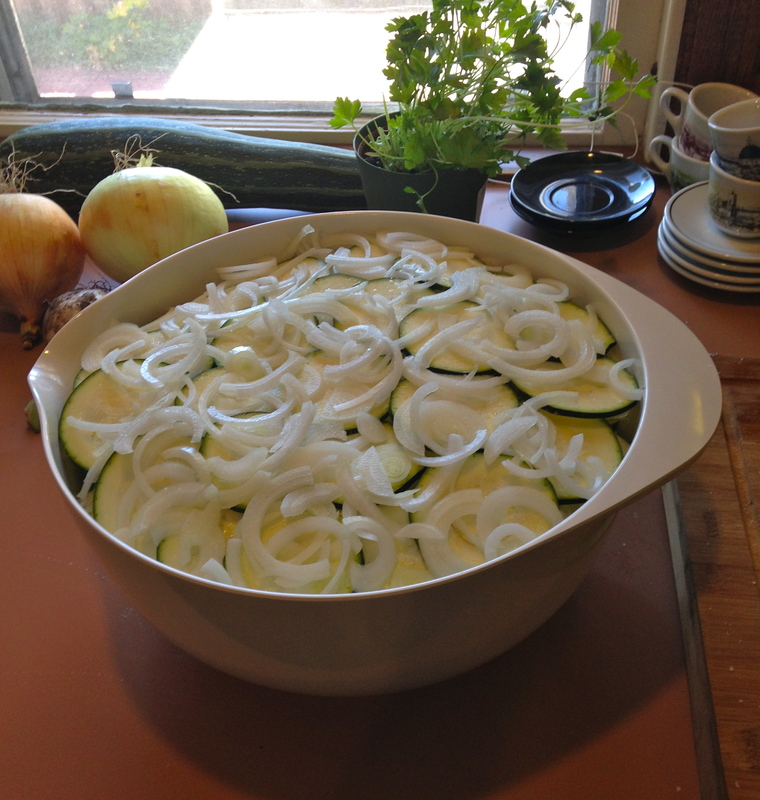 And I always make a huge pot and freeze some to enjoy later in the winter. The spread my family brought was great. 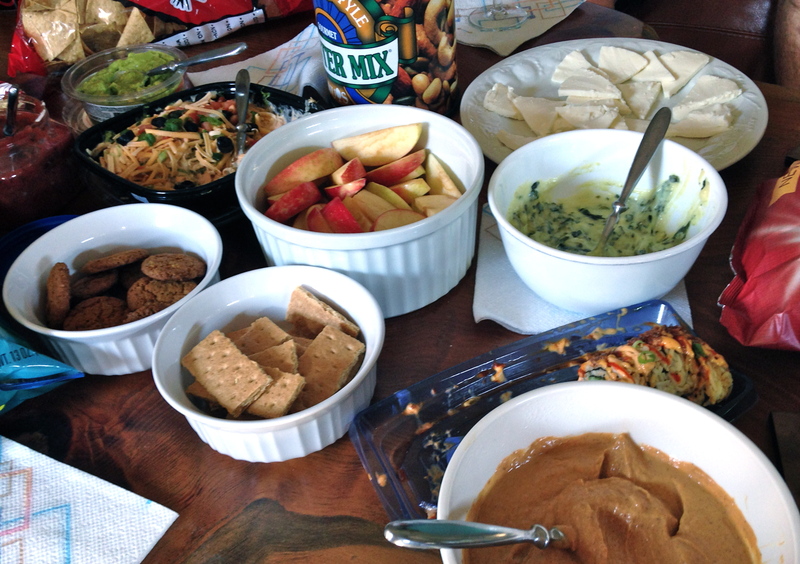 It ranged from guacamole to sushi to a sweet pumpkin dip for apples and gingersnaps. I had so much fun enjoying a Vikings win with my family! 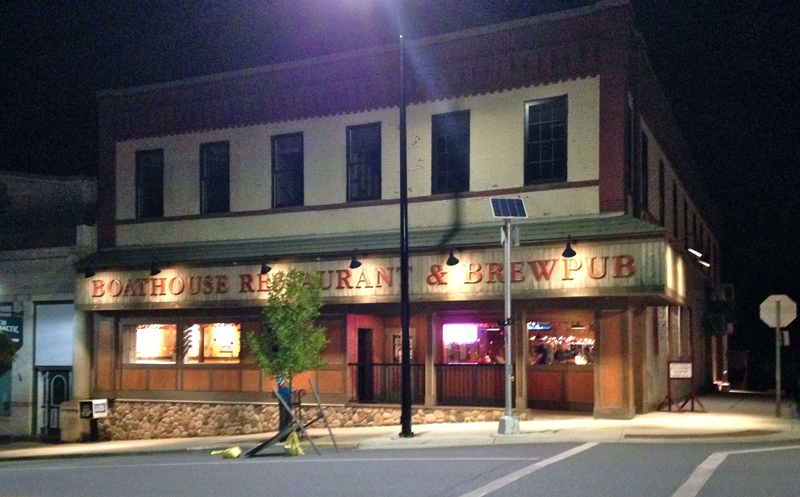 The Boathouse is a great place to find some craft beers (something I love in the US, but were hard to find in Italy). It also has a great rustic Minnesota feel with wood finishing and deer on the walls. 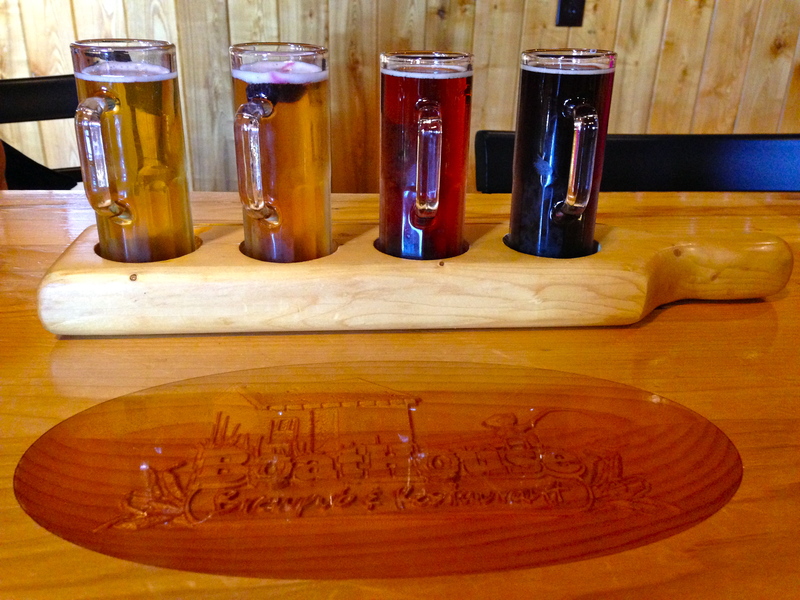 If you can’t decide which beer you’d like to try, you can get a flight. I personally love getting a flight because I love variety, but don’t need the volume. So it’s a great way to get four small, different beers. 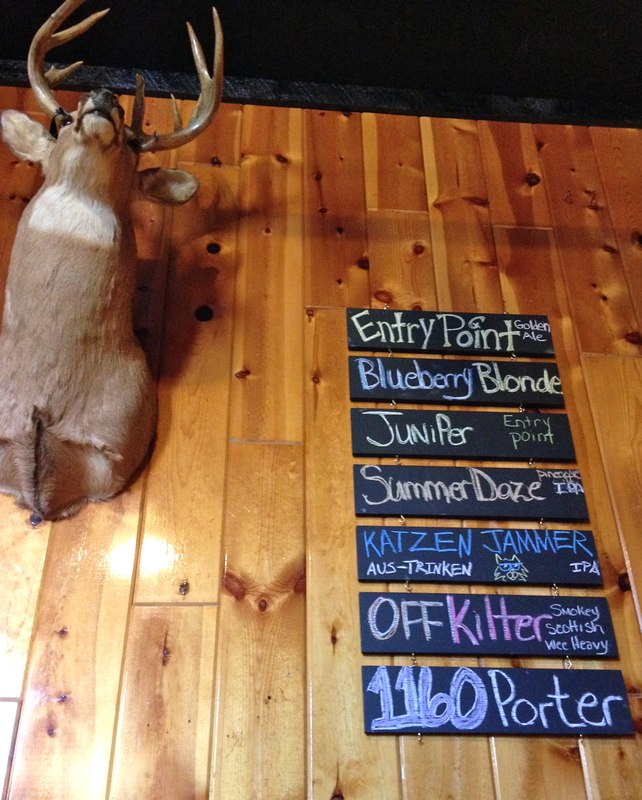 If there is one beer I would say is a must try, it’s their blueberry blonde. I’m not generally fond of fruity beers (or blonde ales, for that matter), but this one is so good. I have it every summer. It is also fun to watch the blueberries float and sink in the beer (they constantly move around). They also have great food. My favorite starter is the gunboats. 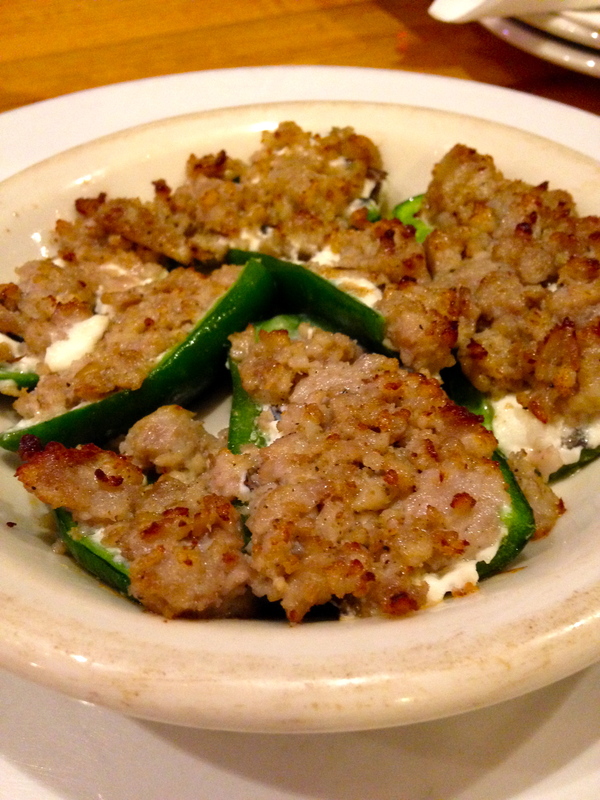 They are jalapeno peppers stuffed with a wild rice cream cheese mixture and topped with crumbled sausage. They are like a lighter jalapeno popper and are really delicious. They also have duck wings on the menu, which I unfortunately don’t have a picture of, but are another great and unique option. 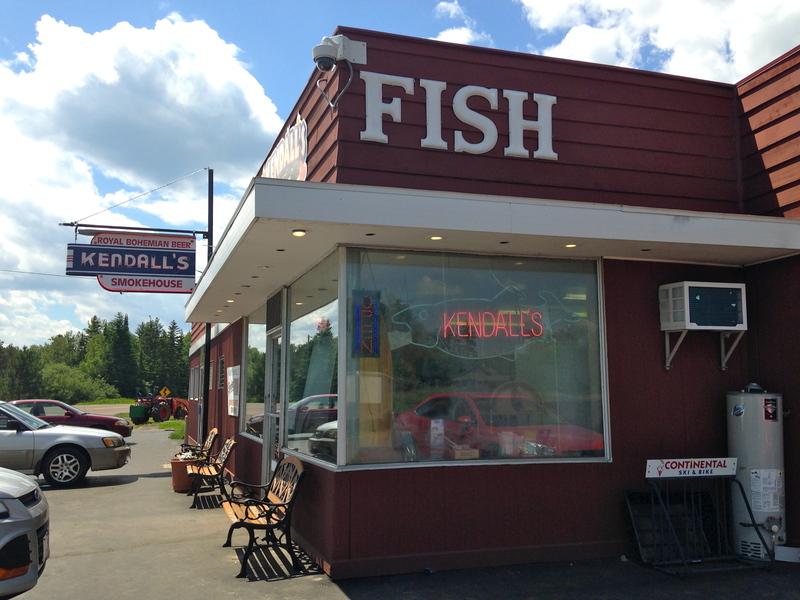 Stopping at Russ Kendall’s on our way back from the cabin became a new tradition this summer. I have no doubt we will continue to do this at least once a summer from this point on. 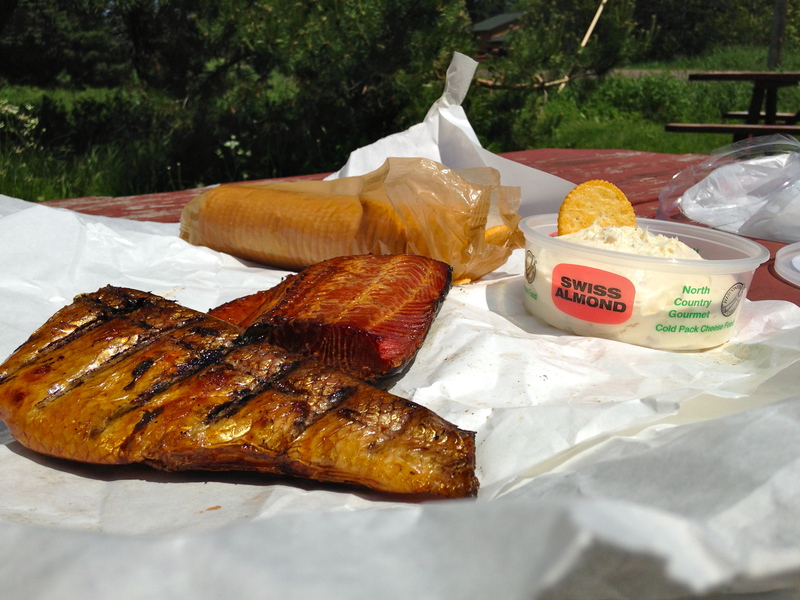 They have roughly eight different kinds of smoked fish including several varieties of salmon, whitefish and lake trout. They also sell tubs of cheese spread (we always get swiss almond which I think goes best with the smoked fish) and crackers. 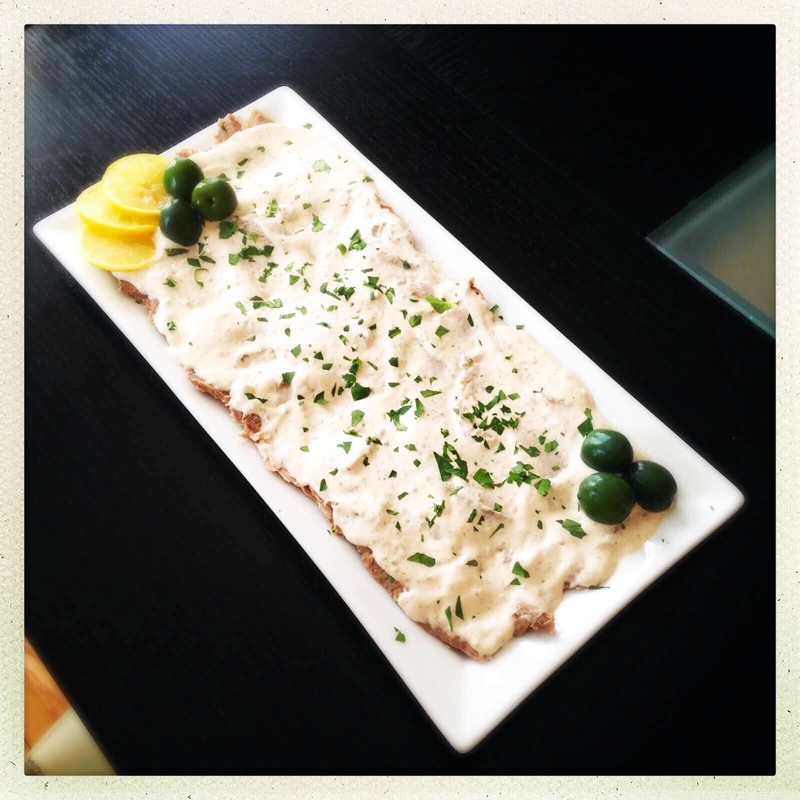 A cracker, some cheese and a piece of smoked fish makes an amazing snack. We bring the fish home and enjoy it for days. There are no doubt more creative things a person could do with this fish, but I like the cracker snacks so much I haven’t even bothered trying anything else. A trip up north would not be complete without walleye. 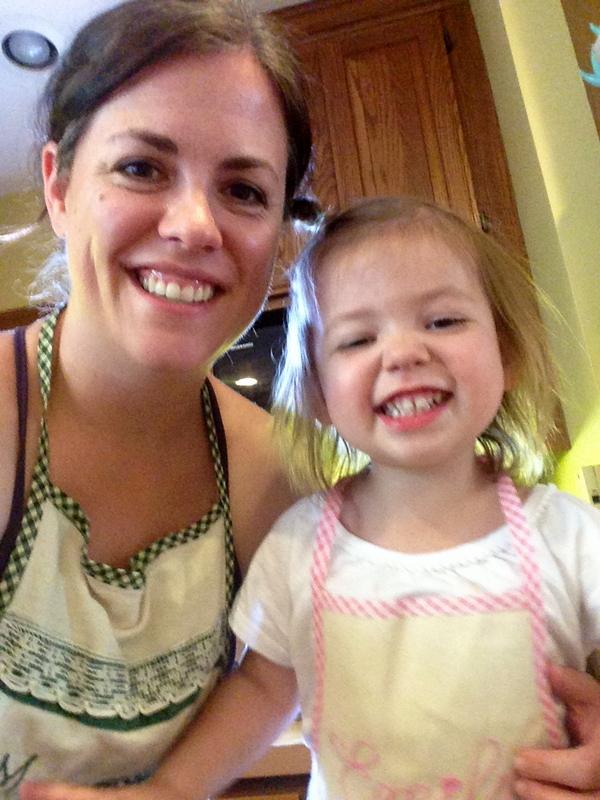 Rockwood is great because they take traditional Minnesota ingredients like walleye and duck and work them into dishes from other regions or countries. One example not pictured is walleye rangoon, a play on crab rangoon. 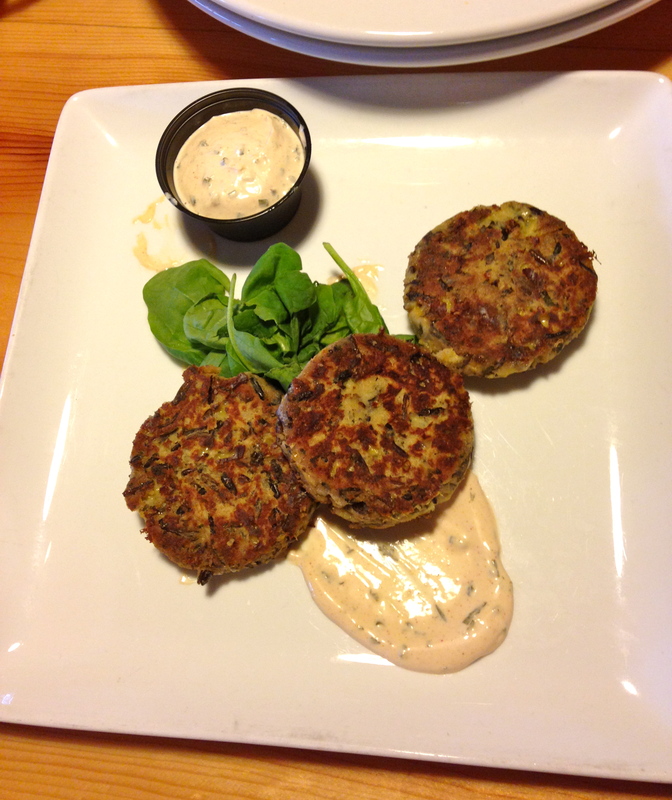 On our last trip to Rockwood, we tried their walleye cakes with wild rice and they were delicious! 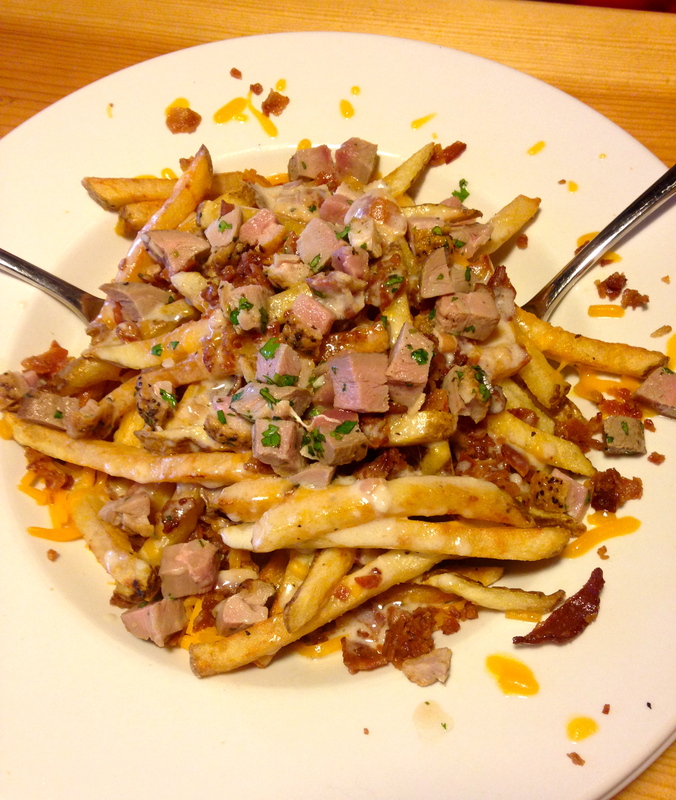 We also tried the poutine with chopped duck breast. Duck is probably my favorite meat. This and the duck wings at Boathouse are the least formal presentations of duck I’ve ever eaten. But they are fantastic! Obviously this is a heavy dish, but it was was delicious and the duck made it even more decadent.